here we go again. From 05 May to 19 May, the tenth BOINC Pentathlon will impose the known, but also new challenges, and SETI.Germany warmly invites all enthusiast teams to join. While the basic concept of five disciplines at five projects of course remains untouched, there are again some innovations: Javelin Throw is a fresh and new discipline and requires the teams to cleverly split their resources, as the rankings are not based on the sum of all points, but only on each team's third best day out of five (not necessarily consecutive) days. This year's Marathon will take place at a subproject of the World Community Grid chosen by the project administrators. The preferences of the participating teams are taken into account, with some limitations, for choosing the projects for the other disciplines. It will be exciting again at the BOINC Pentathlon! C'est reparti! Le dixième BOINC Pentathlon proposera des défis connus et nouveaux du 05 au 19 mai et SETI.Germany invite cordialement toutes les équipes enthousiastes à y participer. Le concept de base - cinq disciplines sur cinq projets - est bien sûr maintenu, mais cette année aussi il y aura quelques nouveautés: Le Lancer de javelot est une discipline toute nouvelle qui demandera une répartition judicieuse des forces de la part des équipes, car ce ne sera pas le total des points obtenus, mais seulement la troisième meilleure journée de cinq jours (pas forcément consécutifs) qui décidera du classement. Cette année, le Marathon aura lieu sur un sous-projet de World Community Grid choisi par les administrateurs du projet. En ce qui concerne le choix des projets pour les autres disciplines, les préférences des équipes participantes seront prises en compte dans le cadre d'une présélection. 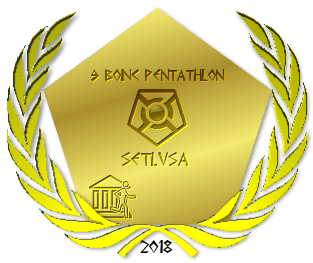 Le BOINC Pentathlon sera encore captivant! es geht wieder los. Der zehnte BOINC Pentathlon wird vom 05. bis 19. Mai bekannte und auch neue Herausforderungen bieten, zu denen SETI.Germany alle Enthusiasten-Teams herzlich einlädt. Das Grundkonzept von fünf Disziplinen bei fünf Projekten bleibt natürlich erhalten, jedoch gibt es auch in diesem Jahr einige Neuerungen: Das Speerwerfen ist eine frische, neue Disziplin und verlangt eine geschickte Kräfteeinteilung von den Teams, da nicht die Summe aller ercrunchten Punkte, sondern lediglich der jeweils drittbeste von fünf (nicht unbedingt aufeinanderfolgenden) Tagen über die Platzierungen entscheidet. Der Marathon findet in diesem Jahr bei einem Subprojekt des World Community Grid nach Wahl der Projektbetreiber statt. Bei der Auswahl der Projekte für die übrigen Disziplinen werden die Vorlieben der teilnehmenden Teams im Rahmen einer Vorauswahl berücksichtigt. Es wird wieder spannend beim BOINC Pentathlon! After two exciting weeks the ninth BOINC Pentathlon ended on 19 May 2018. 32 teams gave it their all in 5 disciplines. A big thank you to the operators of this year's Pentathlon projects, as the competition would not have been possible without their support: NumberFields@home (Marathon), Universe@Home (Swimming), Rosetta@home (Sprint), Asteroids@home (City Run) and PrimeGrid (Cross Country). We'd also like to thank all participants and are looking forward to seeing you again at the tenth BOINC Pentathlon starting on 05 May 2019. For your convenience there is a feedback page for hints, criticisms, wishes and suggestions to take on board for the next time: https://www.seti-germany.de/boinc_pentathlon/feedback.php?&lang=en. Jeeper is now having a look at this year's Pentathlon results. All figures can be found here: https://www.seti-germany.de/boinc_pentathlon/statistiken/pentathlon.php?&lang=en. Before I start with the analysis I would like to thank Modesti and Susanne whole-heartedly. Modesti claims responsibility for the translations into French and Susanne for those into English. The translations contribute substantially to the enjoyment of the Pentathlon by crunchers on a global scale. Many thanks to you both for this work! It’s not so easy to categorize this year’s Pentathlon. 5 teams collected medals, last year there were 6. SETI.USA were even more dominant than last year. However, it was never dull. This year, it was plain to see how gripping individual disciplines could be and that the Overall Standings don’t necessarily have to be all that matters. 32 Teams were at the start, amongst them three newcomers (Chinese Dream, LTT Forums and U.S. Army) who have put up a good show. At the disciplines, NumberFields@home made its debut on the stage. All projects endured throughout valiantly. A big thank you to those responsible for all their support throughout. And now for the final analysis of the 9th BOINC Pentathlon. The rankings in brackets correspond to the sequence: Swimming (Universe@Home), Sprint (Rosetta@home), Cross Country (PrimeGrid), City Run (Asteroids@home), Marathon (NumberFields@home). There’s nothing left to write about. They cleared the lot. 5 times Gold, you can’t do better than that. The Americans entered the stage as dominant as we’ve never seen a team before and their victory in the overall standings was never really endangered. A strong start showing their competitors where the rubber hits the road and then controlling the situation, that was the successful tactic this year. 4 times Silver, no other team has ever managed this. Once again they succeeded in mobilizing their reservists as no other team. The Green Planet were the only team able to keep up reasonably well with SETI.USA. However, their GPU-weakness continues to be a problem. That’s something they need to address urgently as it will otherwise not be possible to beat the Americans, not to forget about the rivals from China. A little better every year. That has applied to Team China for years. 4 times Bronze this year. They thus doubled their medal collection. However, they could have pushed for even more. It’s the mysterious weakness at this year’s Sprint that cost them valuable points. They would otherwise have crowded the Green Planet. Next year, they will no doubt be favourites for Silver and maybe even strive for more. They did their duty with Silver at the Cross Country. But more than that wasn’t to be achieved and in the end, they were a touch too slow. It needed more effort to claim medals at the disciplines or maybe even the courage and finesse for brave tactical manoeuvres. However, they are to be reckoned with where graphic cards are in play and there’s still scope for improvement. This time the Czechs had a better year compared to the last. Whilst they were left without medals last year, they are now in the books with a Bronze at Sprint. However, it was noticeable that the disciplines that were started first became their weak point. On the other hand, this might be the reason why a Bronze at Sprint was even possible. In addition, they were generally always in the middle of the fights for the top places. It was their best ever achievement at a Pentathlon so far. It ought to give rise to celebrations. If it wasn’t for the Marathon. A tactical error there cost them Bronze. That was a real shame as they were so deserving of a medal. At least they aren’t the only ones that has happened to. They will learn from it and be amongst the hot candidates for individual medals next year. This is also the best performance for TeAm AnandTech this far. 5 times rank 7 tells us just about everything we need to know. I had to go back to 2010 to find an equally good ranking. And wouldn’t you know, it was rank 7. This year their strength was their stability and was rightfully rewarded. To add, it’s interesting to see how they got better year on year since 2015. Their rivals should keep them on their radar! Rank 4 at Swimming made us sit up and take notice but that was followed by severe instability. The good outcome at Swimming might have been the cause of the weak performance at the Sprint. For the third time in a row, they finish the Pentathlon at rank 8. They are always good for a surprise but do attract attention on account of their fluctuating performances. It would make more sense if they let the Overall Standings go and invested everything in a discipline. That had nearly worked for them at Swimming. Overclock.net’s performance wasn’t as strong as expected. With their sensational win at Cross Country last year they didn’t get anywhere near the medals this year. Realistically, they weren’t performing any worse than last year, however, their rivals have become stronger and have pulled ahead. They’ve got to be very careful here and shore up, otherwise it will be difficult to hold on to the Top 10 in future. The Rechenkraftlers have been moving along at around rank 10 for years and this year was no exception. Rank 10 was never in any danger which was also due to the fact that the Rechenkraftlers didn’t allow themselves any weaknesses. Consistency will definitely be rewarded at the Pentathlon. That may sound a bit uninteresting but has done the job for them well for years. Meisterkühler had a slightly better run this year. The small drop at the Sprint didn’t cause any damage and was evened out by rank 10 at the Marathon. Compared with last year the results were only marginally better but that was enough to forge ahead in the hard fought over midfield. This year the Australians went to work with far more engagement. They only showed a slight weakness at the City Run. It was noticeable how they started at a slow pace but then continued to plough through the field at a steady pace. They had their best result right at the start with Schwimming. On equal points with BOINC.Italy, USA secured rank 10 at the Sprint and rank 13 in the Overall Standings. Their Achilles’ heel seems to be at the GPU, rank 19 at the Cross Country cost them points. They need to pay attention or be pipped to the post by their rivals. Better than last year, so the Italians can be content. However, Marathon and Cross Country prevented a better standing. They are certainly in a position to get involved nearer the top which they’ve been able to demonstrate in the past. Best newcomer this year are Chinese Dream. However, the zero point finish at the Cross Country cost them valuable points and position. If they could manage to improve on this they could easily move up into the front of the middle field and teach their competitors the meaning of fear. In the end, rank 13 at the Marathon was the trigger for rank 15. I would normally only analyse the first 15 ranks. However, as Crunching@EVGA crossed the finish line on equal points with Chinese Dream, I’ll make an exception. Sprint and City Run were the weak points this year. However, as there was no breakaway to the front, there wasn’t any more in it this time round. AMD Users, BOINC.Italy, BOINCstats, Czech National Team, L'Alliance Francophone, Meisterkuehler.de Team, Planet 3DNow!, SETI.Germany, SETI.USA, Ukraine, Team China. - 5 times Overall Victory was claimed by Planet 3DNow! - Can Team China reach for Gold? - Will [H]ard|OCP claim their first medal? - Which team will take us by surprise? As you can see, it will once again be exciting at the 10th BOINC Pentathlon - from 05 May 2019. Après deux semaines passionnantes, le neuvième BOINC Pentathlon s'est terminé le 19/05/2018. 32 équipes ont donné le meilleur d’elles-mêmes dans 5 disciplines. Nous remercions vivement les administrateurs des projets sélectionnés pour ce Pentathlon. Sans leur soutien, cette compétition n'aurait pas été possible: NumberFields@home (Marathon), Universe@Home (Natation), Rosetta@home (Sprint), Asteroids@home (Course Urbaine) et PrimeGrid (Cross-country). De même, nous remercions tous les participants et nous espérons vous revoir pour le dixième BOINC Pentathlon à partir du 05/05/2019. Nous avons une page de commentaires où vous pouvez nous envoyer vos remarques, critiques, souhaits et propositions d'amélioration pour la prochaine fois: https://www.seti-germany.de/boinc_pentathlon/feedback.php?&lang=fr. Mais reposons notre regard sur le résultat du Pentathlon de cette année. Vous trouverez tous les chiffres ici: https://www.seti-germany.de/boinc_pentathlon/statistiken/pentathlon.php?&lang=fr. Avant d'arriver au classement, je tiens à remercier chaleureusement Modesti et Susanne. Modesti est responsable de la traduction française et Susanne pour la traduction anglaise. Ces traductions contribuent de manière significative au plaisir que procure le Pentathlon à de nombreux cruncheurs dans le monde. Merci à vous deux pour ce travail! Il n'est pas si facile de classer ce Pentathlon. 5 équipes ont décroché des médailles, l'an dernier elles étaient 6. SETI.USA a dominé le challenge encore plus que l'an dernier. Et pourtant on ne s'ennuyait jamais. Peut-être que cette année a montré le plus à quel point les disciplines individuelles sont passionnantes et que le classement général n'est pas tout. 32 équipes au départ dont trois débutantes (Chinese Dream, LTT Forums et U.S. Army), qui se sont battues de manière très honorable. Pour les disciplines, NumberFields@home a eu sa première tribune lors d'un Pentathlon. Tous les projets ont vaillamment tenu le coup. Merci également aux responsables respectifs. Voici donc le classement général du 9e BOINC Pentathlon. Les classements entre parenthèses correspondent aux disciplines dans l'ordre Natation (Universe@Home), Sprint (Rosetta@home), Cross-country (PrimeGrid), Course Urbaine (Asteroids@home), Marathon (NumberFields@home). Quoi écrire? Elle a tout raflé! 5 fois de l'or, elle ne pouvait pas mieux faire. Les Américains étaient dominants comme encore aucune équipe et leur victoire au général n'a jamais réellement été en danger. Montrer à la concurrence de quel bois on se chauffe avec un démarrage en trombe, puis gérer la situation - voici la tactique de réussite de l'année. 4 fois de l'argent, aucune autre équipe n'avait réussi cela jusqu'à présent. Une fois de plus, elle a réussi comme personne à mobiliser ses réservistes. La Planète verte était la seule équipe à pouvoir à peu près suivre SETI.USA. Par contre, la faiblesse au GPU reste toujours son problème. Elle devra impérativement la travailler, sinon il ne sera pas possible de battre les Américains. Et puis, il y a aussi la concurrence de Chine. Chaque année un peu meilleure, c'est ce qui s'applique depuis des années à Team China. 4 fois du bronze cette année. Cela lui a permis de plus que doubler sa collection de médailles. Et pourtant il y aurait sûrement eu moyen de mieux faire. C'est la mystérieuse faiblesse au Sprint qui lui a coûté d'importants points cette année. Sinon, les Chinois seraient tombés sur le râble de la Planète verte. L'année prochaine ils feront sûrement partie des favoris pour l'argent, peut-être même pour plus. Avec l'argent au Cross-country on a fait son devoir. Mais il n'y avait pas moyen d'en faire plus, à la fin l'équipe était un chouilla trop lente. Elle a besoin de plus de puissance sur les disciplines pour décrocher des médailles, ou peut-être simplement du courage et de l'habileté pour des manœuvres tactiques osées. Sinon, elle reste puissante au niveau de la carte graphique, cela peut servir de base. C'était mieux que l'an dernier pour les Tchèques. Après être partis sans médaille l'an dernier, ils ont pu inscrire une médaille de bronze au Sprint dans les annales. Ce qui est surprenant, c'est que les points faibles étaient les disciplines qui ont démarré les premières. D'un autre coté, c'est peut-être aussi la raison qui a rendu le bronze possible au Sprint. Pour le reste, ils étaient toujours au milieu de la bataille pour les places de tête. C'est sa meilleure performance au Pentathlon jusqu'à présent. Ce serait une raison pour faire la fête, s'il n'y avait pas le Marathon où une erreur tactique lui a coûté le bronze. C'est très dommage, car elle aurait vraiment mérité une médaille. En fin de compte, elle n'est pas la dernière à qui cela arrive. Elle apprendra de ces erreurs et comptera l'année prochaine parmi les candidats favoris pour les médailles individuelles. Pour TeAm AnandTech c'est aussi la meilleure performance jusqu'à présent. 5 fois la 7e place - que dire de plus? J'ai dû remonter jusqu'en 2010 pour trouver un aussi bon classement. Et, comment pourrait-il en être autrement, il s'agissait de la 7e place. Cette année, sa force était sa stabilité et elle a été récompensée. À retenir aussi que cette équipe s'améliore d'année en année depuis 2015. La concurrence devra l'avoir sur ses radars! La 4e place à la Natation a fait dresser les oreilles, mais après c'est devenu très instable. La bonne performance à la Natation a entraîné la faiblesse au Sprint. Pour la troisième fois consécutive elle termine le Pentathlon au rang 8. Elle est toujours bonne pour une surprise, mais se fait aussi remarquer par ses performances inégales. Il serait assez judicieux pour elle de se moquer du classement général et de tout miser sur une discipline. Cela a failli marcher à la Natation. Overclock.net est apparue moins puissante que prévu. L'an dernier elle était le vainqueur surprise au Cross-country, alors que cette année elle n'a même pas pu s'approcher des médailles. Dans le fond, elle n'était pas beaucoup plus mauvaise, mais la concurrence est devenue plus forte et l'a doublée. Elle va devoir faire attention et accélérer, sinon il sera difficile de garder le top10 à l'avenir. Depuis des années, les gars et les filles de Rechenkraft tournent autour de la 10e place, cette année ne fait pas exception. Le rang 10 n'a jamais été en danger, entre autres parce qu'ils n'ont pas montré de faiblesse notable. La constance est aussi récompensée lors du Pentathlon. Ça peut sembler ennuyeux, mais ça fonctionne très bien pour eux depuis des années. Cette année a de nouveau été un peu meilleure pour les Meisterkühler. Le coup de mou au Sprint n'a pas fait de dégâts et a été bien compensé par la 10e place au Marathon. Par rapport à l'an dernier, les résultats ne sont que légèrement meilleurs, mais cela a suffi pour progresser dans le peloton central très disputé. Les Australiens étaient nettement plus engagés cette année. Ils n'ont eu qu'une petite faiblesse à la Course Urbaine. À noter qu'ils ont démarré lentement, mais qu'ils ont remonté le peloton lentement mais sûrement. Ils ont eu leur meilleure performance à la Natation, tout de suite au début. L'égalité de points avec BOINC.Italy a sécurisé la 10e place au Sprint et le rang 13 au classement général. Son talon d'Achille semble être le GPU: la 19e place au Cross-country lui a coûté des points. Il s'agit de faire attention ici, sinon la concurrence risque de lui passer dessus. C'est mieux que l'an dernier, les Italiens peuvent être satisfaits. Par contre, le Marathon et le Cross-country ont empêché un meilleur classement. Ils sont tout à fait capables de jouer dans des rangs plus élevés, ce qu'ils ont déjà montré par le passé. Le meilleur débutant de l'année est Chinese Dream. Par contre, la défaite au Cross-country lui coûte d'importants points et rangs. Si elle arrive à accélérer ici, elle pourra facilement remonter jusqu'en tête du peloton central. Elle pourrait aussi apprendre aux autres ce qu'est la peur grâce à sa stabilité. À la fin, c'est le rang 13 au Marathon qui a fait pencher la balance pour la 15e place au général. Normalement je ne commente que les 15 premières places, mais comme Crunching@EVGA a passé l'arrivée ex æquo avec Chinese Dream je fais une exception. Cette année, le Sprint et la Course Urbaine étaient les points faibles. Mais comme il n'y a pas eu d'échappé vers le haut, cela n'a pas suffi pour plus cette année. - Team China pourra-t-elle attraper l'or? - [H]ard|OCP décrochera-t-elle sa première médaille? - Quelle équipe nous surprendra? Vous voyez, le 10e BOINC Pentathlon sera de nouveau captivant - à partir du 05/05/2019. Am 19.05.2018 ging nach zwei spannenden Wochen der neunte BOINC Pentathlon zu Ende. In 5 Disziplinen gaben 32 Teams ihr Bestes. Ein großer Dank geht an die Betreiber der diesjährigen Pentathlon-Projekte, ohne deren Unterstützung der Wettbewerb nicht möglich gewesen wäre: NumberFields@home (Marathon), Universe@Home (Schwimmen), Rosetta@home (Sprint), Asteroids@home (Stadtlauf) und PrimeGrid (Querfeldein). Ebenso danken wir allen Teilnehmern und hoffen, euch beim zehnten BOINC Pentathlon ab dem 05.05.2019 wiederzusehen. Für Hinweise, Kritik, Wünsche und Verbesserungsvorschläge für das nächste Mal gibt es eine Feedback-Seite: https://www.seti-germany.de/boinc_pentathlon/feedback.php?&lang=de. Nun wendet Jeeper seinen Blick noch einmal dem Ergebnis des diesjährigen Pentathlons zu. Alle Zahlen sind hier zu finden: https://www.seti-germany.de/boinc_pentathlon/statistiken/pentathlon.php?&lang=de. Bevor ich zur Auswertung komme, möchte ich mich ganz herzlich bei Modesti und Susanne bedanken. Modesti zeichnet für Übersetzung ins Französische und Susanne für die Übersetzung ins Englische verantwortlich. Die Übersetzungen tragen maßgeblich dazu bei, dass der Pentathlon global vielen Crunchern Spaß macht. Vielen Dank euch beiden für diese Arbeit! Den diesjährigen Pentathlon einzuordnen ist gar nicht so einfach. 5 Teams holten Medaillen, letztes Jahr waren es 6. SETI.USA dominierte noch stärker als vergangenes Jahr. Langweilig war es dennoch nie. In diesem Jahr wurde wohl am stärksten deutlich, wie spannend die Einzeldisziplinen sind und dass die Gesamtwertung eben nicht alles ist. 32 Teams waren angetreten, darunter drei Neueinsteiger (Chinese Dream, LTT Forums und U.S. Army), die sich sehr achtbar geschlagen haben. Bei den Disziplinen durfte NumberFields@home das erste Mal beim Pentathlon eine Bühne stellen. Alle Projekte haben wacker durchgehalten. Vielen Dank auch an die entsprechenden Verantwortlichen. Hier nun die Gesamtauswertung des 9. 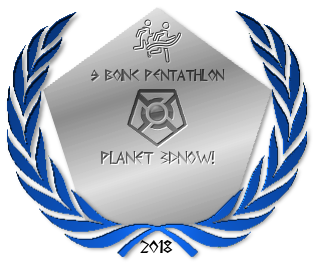 BOINC Pentathlon. Die Platzierungen in den Klammern entsprechen der Reihenfolge Schwimmen (Universe@Home), Sprint (Rosetta@home), Querfeldein (PrimeGrid), Stadtlauf (Asteroids@home), Marathon (NumberFields@home). Was soll man da noch schreiben. Alles abgeräumt. 5 Mal Gold, besser geht es nicht. Dominant wie noch nie ein Team sind die Amerikaner aufgetreten und ihr Gesamtsieg war nie wirklich in Gefahr. Mit einem starkem Start der Konkurrenz zeigen wo der Hammer hängt und dann die Lage kontrollieren, das war die erfolgreiche Taktik in diesem Jahr. 4 Mal Silber, das hat bisher auch kein Team geschafft. Wieder gelang es Ihnen, wie keinem anderen Team, ihre Reservisten zu mobilisieren. Der grüne Planet war das einzige Team das SETI.USA einigermaßen folgen konnte. Allerdings bleibt GPU-Schwäche weiterhin das Problem. Daran müssen sie dringend arbeiten, denn ansonsten wird es nicht möglich sein die Amerikaner zu schlagen und dann ist ja noch die Konkurrenz aus China. Jedes Jahr ein bischen besser. Das trifft seit Jahren auf Team China zu. 4 Mal Bronze in diesem Jahr. Damit hat man die Medaillensammlung mehr als verdoppelt. Und dabei wäre durchaus mehr drin gewesen. Es ist die mysteriöse Schwäche beim diesjährigen Sprint, die wichtige Punkte gekostet hat. Ansonsten wären sie dem grünen Planeten sehr dicht auf die Pelle gerückt. Im nächsten Jahr gehören sie sicher zu den Favoriten auf Silber, vielleicht sogar für mehr. Mit Silber beim Querfeldein hat man seine Pflicht getan. Mehr war aber nicht drin, am Ende war man ein Tick zu langsam. Bei den Disziplinen braucht es mehr Kraft, um Medaillen zu holen, oder vielleicht auch mal den Mut und Geschick für mutige taktische Manöver. Ansonsten bleiben sie eine Macht an der Grafikkarte, darauf lässt sich aufbauen. Besser als im Vorjahr lief es für die Tschechen. Nachdem man im letzten Jahr medaillenlos geblieben war, steht nun Bronze beim Sprint in den Büchern. Auffällig ist aber, dass die Disziplinen, die als erstes gestartet wurden, der Schwachpunkt waren. Andererseits ist dies vielleicht auch der Grund, warum Bronze beim Sprint überhaupt möglich war. Ansonsten waren sie immer mittendrin beim Kampf um die vorderen Plätze. Es war die beste Leistung beim Pentathlon bisher. Eigentlich ein Grund zu feiern. Wäre da nicht der Marathon. Ein taktischer Fehler kostete sie dort Bronze. Das ist sehr schade, denn eine Medaille hätten sie wirklich verdient gehabt. Letztlich sind sie nicht die ersten, denen derartiges widerfährt. Sie werden daraus lernen und im nächsten Jahr zu den heißen Anwärtern auf Einzelmedaillen zählen. Auch für TeAm AnandTech ist es die besten Leistung bisher. 5 Mal Platz 7 sagt eigentlich schon alles. Ich musste bis 2010 zurückgehen, um eine ebenso gute Platzierung zu finden. Und wie sollte es auch anders sein, es war Platz 7. Ihre Stabilität war in diesem Jahr ihre Stärke und wurde belohnt. Interessant auch, dass sie sich seit 2015 jedes Jahr verbessern. Die Konkurrenz sollte sie auf dem Schirm haben! Platz 4 beim Schwimmen ließ aufhorchen, doch dann wurde es arg instabil. Die gute Leistung beim Schwimmen hatte die Schwäche beim Sprint zur Folge. Zum dritten Mal in Folge schließen sie den Pentathlon auf Platz 8 ab. Sie sind immer für eine Überraschung gut, aber fallen auch durch schwankende Leistungen auf. Für sie macht es durchaus Sinn, auf die Gesamtwertung zu pfeifen und voll auf eine Disziplin zu setzen. Beim Schwimmen hätte dies ja fast funktioniert. Nicht ganz so stark wie erwartet trat Overclock.net auf. Im vergangenen Jahr noch Sensationssieger beim Querfeldein, kamen sie in diesem Jahr nicht in die Nähe der Medaillen. Im Grunde waren sie nicht viel schlechter unterwegs, allerdings ist die Konkurrenz stärker geworden und vorbeigezogen. Hier müssen sie aufpassen und nachlegen, ansonsten wird es schwer werden, die Top 10 in Zukunft zu halten. Seit Jahren sind die Rechenkraftler um Platz 10 unterwegs, so auch in diesem Jahr. Rang 10 war nie in Gefahr, auch weil sich die Rechenkraftler keine nennenswerten Schwächen leisteten. Konstanz wird beim Pentathlon durchaus auch belohnt. Das wirkt vielleicht langweilig, funktioniert aber seit Jahren für sie sehr gut. Etwas besser lief es dieses Jahr wieder für die Meisterkühler. Der kleine Hänger beim Sprint richtete keinen Schaden an und wurde durch Platz 10 beim Marathon gut ausgeglichen. Gegenüber dem letzten Jahr waren die Ergebnisse zwar nur leicht besser, aber das reichte aus, um sich im hart umkämpften Mittelfeld nach vorne zu arbeiten. Deutlich engagierter zur Werke gingen die Australier in diesem Jahr. Nur beim Stadtlauf schwächelten sie etwas. Auffällig war, dass sie langsam starteten und sich dann langsam aber stetig durch das Feld pflügten. Ihre beste Leistung hatten sie beim Schwimmen gleich am Anfang. Punktgleich mit BOINC.Italy sicherte Platz 10 beim Sprint Rang 13 in der Gesamtabrechnung. Ihre Achillesferse scheint die GPU zu sein, Platz 19 beim Querfeldein kostete Punkte. Hier heißt es aufpassen, ansonsten droht man von der Konkurrenz überholt zu werden. Besser als letztes Jahr, können die Italiener zufrieden sein. Marathon und Querfeldein verhinderten aber eine bessere Platzierung. Sie sind durchaus in der Lage, weiter vorn mitzuspielen, was sie in der Vergangenheit ja auch schon gezeigt haben. Bester Neueinsteiger in diesem Jahr ist Chinese Dream. Allerdings kostete sie die Nullnummer beim Querfeldein wichtige Punkte und Plätze. Wenn es ihnen gelingt, hier nachzulegen, werden sie locker zum vorderen Mittelfeld aufschließen und könnten mit ihrer Stabilität das Fürchten lehren. Am Ende gab Platz 13 beim Marathon den Ausschlag für Rang 15. Normalerweise bewerte ich nur die ersten 15 Plätze. Da Crunching@EVGA punktgleich mit Chinese Dream durchs Ziel ging, mache ich aber eine Ausnahme. Sprint und Stadtlauf waren die Schwachpunkte in diesem Jahr. Da es aber keinen Ausreißer nach oben gibt, war in diesem Jahr nicht mehr drin. - Kann Team China nach Gold greifen? - Holt sich [H]ard|OCP seine erste Medaille? - Welches Team wird uns überraschen? Ihr seht, es wird wieder spannend beim 10. BOINC Pentathlon - ab 05.05.2019. The deed is done. All participants can give themselves a pat on the back for the 9th time as hardware, body and soul have been taken to their limit and often beyond. Some of you may have redrawn your boundary of endurance. It’s now time to recuperate and to look back at the events of the last few days. As is customary, the report will appear in two parts. Part 1 will deal with the outcome of the disciplines whereas part 2 following behind will be concerned with the Overall Standings. This discipline which takes us over the traditional route ended surprisingly quiet. The great bunker battle failed to materialize which gave us an insight into how exhausted the teams were. SUSA won the City Run and were not even being pressured by any of their rivals. P3D took Silver ahead of Team China. Congratulations to the medal winners. Though they tried their hardest, SG remained at #4 but as there was no challenge by CNT (#5), there was thus no danger from behind. AF can also be content with #6 which shows what a great race the Francophones had. Rank #7 did of course go to TAAT who were an example of consistency this year. [H] were left with #8 and at that with a great margin. Had they been prepared to sacrificed this, it might have been enough to reach Bronze at the Marathon. With a final spurt, RKN snatched rank 9 and thus relegated OCN to #10. It’s the first time this year that the Overclocker’s position isn’t in single figures. LITOMYSL should be popping the corks, rank 11; it took me a while to find another example of such a good standing at a discipline. In 2014 we find them at 10th place in our history and thus #11 is by a long way the second best achievement of this team at a Pentathlon ever. Rank 12 goes to USA ahead of BOINC.Italy (#13). On the final day, Meisterkühler were able to show improvement to claim #14 and thus ditched SETIKAH (#15). For the Koreans this is not a reason to cry as this ranking is this year’s highlight for them. Next over the finish line follow Chinese Dream (#16) and in so doing, they left BOINC@AUSTRALIA (#17) behind them. This year, the City Run constituted Australia’s weak point, on the other hand, last year, rank 17 at the Cross Country was the team’s best individual ranking; there’s going to be a lot of lamenting at the highest level. Rank 18 goes to the Ukraine. Here too, the final spurt was the deciding factor. It thus allowed them to run past Crunching@EVGA (#19). AMD Users secured #20. Behind them, BOINC@Poland dragged themselves over the finish line at #21. Just in time as BOINC@MIXI (#22) were advancing at quite a tempo having already steamrollered BOINCstats (#23) and 2ch (#25). Crystal Dream were able to get into the fray and improved their standing to #24. Das Kartell (#26), however, preferred peace and quiet, their attack did not happen. Indeed, there was no threat from behind. Although LTT Forums improved onto #27, the margin was already quite pronounced. Thus, UK BOINC Team had to content with #28 but were able to leave BOINC Confederation (#29), US Army (#30), BOINC@Pfalz (#31) and SETI.Bitola (#32) behind them. Victory went to SUSA and thus in the 5th Discipline for this year. They made their intentions known on the very first day and as the assembled competitors didn’t dare to rough things up, couldn’t in the end avert the American win. Silver went to P3D who were able to keep Team China off their backs in the end. Congratulations. In the end, [H] were left with only #4. It looks as if they felt secure far too soon and invested too many resources in the City Run. This shows us once again why tactics can be so decisive in the Pentathlon. SG had the luxury of trundling along in the last few metres as #5 couldn’t still be taken from them. This also applied perfectly to OCN who crossed the finish line at #6 and in so doing, recorded the best individual result in this year’s Pentathlon. TAAT were able to secure #7 in the end as neither CNT (#8) nor AF (#9) had the power to influence that. Behind, the photo finish had to decide the order. MK or AMD Users, that was the question. It was enough for Meisterkühler in the end for #10. Even though AMD Users (#11) didn’t manage the jump into the Top 10 they were able to celebrate their achievement along with MK because it was the best ranking for both this year. Not in any danger behind, RKN collected #12 and thereby completed the dozen. Chinese Dreams managed to turn on the heat and BOINC@AUSTRALIA had to sweat it out for a bit. With a final spurt, the Chinese collected #13 and must have given BOINC@AUSTRALIA (#14) quite a surprise at the finish. This end spurt topped off the Chinese in their first Pentathlon and brought them up to #15 in the Overall Standings. There was no resistance to this Chinese onslaught by USA (#15) and Crunching@EVGA (#16). Even behind there were no changes to record in the end. BOINC.Italy claimed #17, ahead of Ukraine (#18). Their best result at a CPU-discipline this year showed BOINC@MIXI (#19) ahead of 2ch (#20) and UK BOINC Team (#21). That lively fight by the trio at #22 has now been decided. Das Kartell (#22) came out on top, LTT Forums (#23) finished in the middle which left BOINCstats (#24) at the bottom. LITOMYSL (#25) had quite a lot of fun behind, being the silent spectator. The end of the field is led by Crystal Dream (#26) ahead of BOINC@Poland (#27) who didn’t seem to be true fans of the long track. Then follow SETIKAH (#28) who also had their weak point. BOINC Confederation (#29), U.S. Army (#30) and BOINC@Pfalz (#31) conclude the field of teams which started. C'est fait! Pour la 9e fois, tous les participants peuvent se féliciter, car le matériel, les corps et les esprits ont été poussés jusqu'à leurs limites, voire au-delà par endroits. Certains ont même été jusqu'à redéfinir de nouvelles frontières. Il est temps maintenant de se reposer un peu et de passer en revue les derniers jours. Comme d'habitude, le compte-rendu paraîtra en deux parties: La 1ère partie s'occupera des résultats des disciplines, tandis que la 2e partie traitera du classement général. Cette discipline sur la piste traditionnelle s'est terminée de manière étonnamment calme. La grande bataille des lâchers n'a pas eu lieu, ce qui semble montrer l'épuisement des équipes. SUSA gagne la Course Urbaine sans que la concurrence ne réussisse à la mettre sous pression. P3D décroche l'argent devant Team China. Félicitations à toutes les médaillées! Malgré une tentative, SG est restée au rang 4. Mais comme CNT (#5) n'a rien tenté, il n'y avait aucun risque de se faire surprendre par l'arrière. L'AF peut également être satisfaite: avec leur 6e place, les Francophones se sont bien débrouillés. La 7e place va bien sûr à TAAT qui était un modèle de régularité cette année. Pour [H], il reste la 8e place avec une bonne avance sur son poursuivant. Si elle l'avait sacrifié, elle aurait pu atteindre le bronze au Marathon. Avec un sprint final, RKN a chopé la 9e place et renvoyé OCN au rang 10. Pour les Overclocker c'est la première fois cette année où leur classement est à deux chiffres. Chez LITOMYSL on peut vraiment sabler le champagne: place 11. J'ai dû chercher un moment pour trouver une telle performance sur une discipline: en 2014, avec une 10e place dans les annales. Cette 11e place est donc de loin le deuxième meilleur résultat de l'équipe au Pentathlon depuis le début. La 12e place va à USA, devant BOINC.Italy (#13). Les Meisterkühler ont réussi à se hisser au rang 14 le dernier jour et ont ainsi laissé SETIKAH (#15) sur place. Ce n'est pas une raison pour pleurer pour les Coréens, car ce classement est leur point fort de l'année. Chinese Dream (#16) a traversé la ligne d'arrivée ensuite; elle a ainsi laissé BOINC@AUSTRALIA (#17) derrière elle. La Course Urbaine est le point faible des Australiens cette année, toutefois, l'an dernier la 17e place était le meilleur classement individuel (au Cross-country) de cette équipe; elle se désole donc à un niveau élevé. Le rang 18 va à l'Ukraine. Ici aussi, le sprint final était décisif. Il lui a permis de dépasser Crunching@EVGA (#19). Les AMD Users ont sécurisé le rang 20. Derrière, BOINC@Poland s'est traîné à travers la ligne d'arrivée à la 21e place. Juste à temps, car BOINC@MIXI (#22) est arrivée à toute blinde et venait de passer sur BOINCstats (#23) et 2ch (#25). Crystal Dream s'en est également mêlé et a progressé au rang 24. En revanche, Das Kartell (#26) cherchait plutôt le calme, il n'y a pas eu d'attaque. Il n'y avait pas de danger à l'arrière non plus. LTT Forums a certes progressé au rang 27, mais l'écart était déjà passablement grand. Ainsi, UK BOINC Team doit se contenter de la 28e place, mais elle peut laisser BOINC Confederation (#29), U.S. Army (#30), BOINC@Pfalz (#31) et SETI.Bitola (#32) derrière elle. La victoire va à SUSA qui gagne ainsi la 5e discipline de l'année. Dès le premier jour les Américains ont clarifié la situation et comme aucun concurrent n'a osé faire quelque chose de féroce, il n'y a pas eu d'atteinte à la victoire américaine. L'argent va à P3D, qui a finalement réussi à garder Team China à distance. Toutes nos félicitations! Pour [H] il ne reste au final que le rang 4. Elle devait être trop sûre d'elle trop tôt et a investi trop de puissance dans la Course Urbaine. Cela montre une fois de plus, que la tactique est décisive au Pentathlon. SG a pu ralentir un peu sur les derniers mètres, car cela faisait déjà un certain temps que la 5e place ne pouvait plus lui échapper. Cela s'applique aussi parfaitement à OCN qui est arrivée 6e et a ainsi enregistré son meilleur classement individuel lors de ce Pentathlon. À la fin, TAAT a réussi à sécuriser la 7e place, car ni CNT (#8), ni l'AF (#9) n'avaient la force d'y changer quelque chose. Derrière, il a fallu une photo-finish: MK ou AMD Users, telle était la question. Finalement, les Meisterkühler ont réussi à décrocher le rang 10. Même si les AMD Users (#11) n'ont pas réussi à rentrer dans le top10, ils peuvent fêter l'événement avec MK, car pour les deux équipes il s'agit de leur meilleur classement cette année. Derrière, RKN a décroché sans danger le rang 12 et complète ainsi la douzaine. Chinese Dream a corsé un peu les choses et BOINC@AUSTRALIA s'est vraiment mise à transpirer. Les Chinois ont décroché la 13e place au sprint final et ont dû sacrément surprendre BOINC@AUSTRALIA (#14) à la fin. Ce sprint final couronnait le premier Pentathlon des Chinois et les a propulsé au rang 15 au général. USA (#15) et Crunching@EVGA (#16) n'avaient plus rien à opposer à cette attaque des Chinois. Derrière, il n'y a plus eu de changements sur la fin. BOINC.Italy a décroché le rang 17, devant l'Ukraine (#18). BOINC@MIXI (#19) a montré sa meilleure performance sur une discipline CPU ici cette année, ce qui la place devant 2ch (#20) et UK BOINC Team (#21). Le ménage à trois autour de la 22e place s'est également décidé: Das Kartell (#22) peut être dessus, LITOMYSL (#23) se retrouve au milieu et BOINCstats (#24) doit se coucher dessous. En tant qu'observatrice discrète, LITOMYSL (#25) s'est bien amusée. En fin de peloton, Crystal Dream (#26) ouvre la marche devant BOINC@Poland (#27) qui ne semble pas vraiment être fan de la piste longue. Suivent SETIKAH (#28) dont c'était également un point faible. BOINC Confederation (#29), U.S. Army (#30) et BOINC@Pfalz (#31) ferment la marche des équipes au départ. Es ist geschafft. Zum 9. Mal können sich alle Teilnehmer auf die Schulter klopfen, denn Hardware, Körper und Geist wurden an ihre Grenzen gebracht und hier und da auch darüber hinaus. Manch einer hat sie gar neu ziehen können. Jetzt ist Zeit, sich etwas zu erholen und die letzten Tage Revue passieren zu lassen. Wie gewohnt wird der Bericht in zwei Teilen erscheinen. Der 1. Teil wird sich mit dem Ausgang der Disziplinen beschäftigen, der dann noch folgende 2. Teil mit der Gesamtwertung. Erstaunlich ruhig endete die Disziplin über die Traditionsstrecke. Die große Bunkerschlacht blieb aus, da ist wohl die Erschöpfung der Teams zu sehen. SUSA gewinnt den Stadtlauf und konnte auch nicht durch die Konkurrenz unter Druck gebracht haben. Silber holt sich P3D vor Team China. Herzlichen Glückwunsch an die Medaillengewinner. Für SG blieb es trotz Versuch bei #4, da aber ein solcher von CNT (#5) ausblieb, bestand keine Gefahr, von hinten überrascht zu werden. Zufrieden kann auch AF sein, mit #6 waren die Francophonen gut dabei. Platz #7 geht natürlich an TAAT, die in diesem Jahr ein Muster von Beständigkeit waren. Für [H] blieb #8 und das mit einem guten Vorsprung. Den zu opfern, hätte für Bronze beim Marathon gereicht. Platz 9 schnappte sich im Endspurt RKN und verwies damit OCN auf #10. Für die Overclocker ist es das einzige Mal in diesem Jahr, das ihre Platzierung nicht einstellig ist. Bei LITOMYSL dürfen wirklich die Korken knallen. Platz 11; ich musste schon lange suchen um eine so gute Leistung bei einer Disziplin auszumachen. 2014 stand einmal ein 10. Platz in den Annalen und so stellt dieser #11 mit Abstand das zweitbeste Ergebnis des Teams beim Pentathlon überhaupt dar. Platz 12 geht an die USA vor BOINC.Italy (#13). Die Meisterkühler konnte sich am Schlusstag noch auf #14 verbessern und ließen so SETIKAH (#15) eiskalt stehen. Für die Koreaner kein Grund zu weinen, denn diese Platzierung ist ihr diesjähriges Highlight. Danach folgte Chinese Dream (#16) ins Ziel und ließ somit BOINC@AUSTRALIA (#17) hinter sich. Der Stadtlauf stellt in diesem Jahr den Schwachpunkt der Australia dar, allerdings war im vergangenen Jahr Rang 17 die beste Einzel-Platzierung (beim Querfeldein) des Teams; ist also Jammern auf hohem Niveau. Rang 18 geht an die Ukraine. Auch hier war der Endspurt entscheidend. Denn so konnten sie sich noch an Crunching@EVGA (#19) vorbeilaufen. Die AMD Users sicherten #20 ab. Dahinter schleppte sich BOINC@Poland auf #21 ins Ziel. Gerade rechtzeitig, denn BOINC@MIXI (#22) kam mit gehörigen Tempoüberschuss an und hatte bereits BOINCstats (#23) und 2ch (#25) überrollt. Crystal Dream durfte auch noch mitmischen und verbesserte sich auf #24. Das Kartell (#26) war dagegen eher auf Ruhe aus, einen Angriff gab es nicht. Von hinten drohte ja auch keine Gefahr. LTT Forums verbesserte sich zwar auf #27, aber der Abstand war bereits deutlich. So muss das UK BOINC Team sich mit #28 begnügen, kann aber die BOINC Confederation (#29), U.S. Army (#30), BOINC@Pfalz (#31) und SETI.Bitola (#32) hinter sich lassen. Der Sieg geht an SUSA und damit die 5. Disziplin in diesem Jahr. Bereits am ersten Tag sorgten die Amerikaner für klare Verhältnisse und da sich die versammelte Konkurrenz nicht traute, etwas Wildes zu machen, änderte sich auch nichts mehr am amerikanischen Sieg. Silber geht an P3D, die sich am Ende Team China vom Leib halten konnten. Herzlichen Glückwunsch! Für [H] bleibt am Ende nur #4. Da war man sich wohl zu früh zu sicher und hat zu viel Kraft in den Stadtlauf investiert. Dies zeigt wieder einmal, dass Taktik beim Pentathlon entscheidend ist. SG konnte die letzten Meter locker austrudeln lassen, denn #5 war ihnen schon einige Zeit nicht zu nehmen. Dies trifft auch perfekt auf OCN zu, die als #6 durchs Ziel kamen und damit die beste Einzelplatzierung beim diesjährigen Fünfkampf verbuchen konnten. TAAT konnte sich am Ende #7 sichern, da weder CNT (#8) noch AF (#9) die Kraft hatten, daran etwas zu ändern. Dahinter musste das Fotofinish entscheiden. MK oder AMD Users, das war die Frage. Am Ende reichte es für die Meisterkühler für #10. Auch wenn die AMD Users (#11) den Sprung in den Top 10 nicht schafften, können sie mit MK dieses Ergebnis feiern, denn für beide ist es die beste Platzierung in diesem Jahr. Dahinter holte RKN ungefährdet #12 und machte so das Dutzend voll. Chinese Dream machte es nochmal spannend und BOINC@AUSTRALIA kam so richtig ins schwitzen. Die Chinesen holten sich im Endspurt #13 und dürften BOINC@AUSTRALIA (#14) am Ende richtig überrascht haben. Mit diesem Endspurt krönten die Chinesen ihren ersten Pentathlon und brachte sie in der Gesamtwertung auf #15. Den Ansturm der Chinesen konnte USA (#15) und Crunching@EVGA (#16) nichts mehr entgegen setzen. Auch dahinter gab es am Ende keine Veränderungen mehr. BOINC.Italy holte sich #17, vor Ukraine (#18). Ihre beste Leistung bei einer CPU-Disziplin in diesem Jahr zeigte BOINC@MIXI (#19) vor 2ch (#20) und dem UK BOINC Team (#21). Der flotte Dreier um #22 ist nun auch entschieden. Oben liegen darf Das Kartell (#22), in die Mitte soll LITOMYSL (#23) und unten liegen muss BOINCstats (#24). LITOMYSL (#25) hatte als stiller Beobachter dahinter eine Menge Spaß. Dem Ende des Feldes darf Crystal Dream (#26) vorstehen, vor BOINC@Poland (#27), die wohl keine wirklichen Fans von der Langstrecke scheinen. Es folgt SETIKAH (#28), die ebenso ihren Schwachpunkt hatten. BOINC Confederation (#29), U.S. Army (#30) und BOINC@Pfalz (#31) beschließen das gestartete Feld. The project Asteroids@home in the discipline City Run ended on 19 May 2018 at 0.00 (UTC). The final results are available at https://www.seti-germany.de/boinc_pentathlon/statistiken/challenge.php?challengeid=4&lang=en. Hence, SETI.USA receives 100 points for the overall rankings and the gold medal in this discipline. Hence, Planet 3DNow! receives 90 points for the overall rankings and the silver medal in this discipline. Hence, Team China receives 80 points for the overall rankings and the bronze medal in this discipline. Le 19/05/2018 à 0h00 (UTC) s’est terminée la discipline Course Urbaine avec le projet Asteroids@home. Vous trouverez le résultat final pour ce projet sur cette page: https://www.seti-germany.de/boinc_pentathlon/statistiken/challenge.php?challengeid=4&lang=fr. SETI.USA reçoit donc 100 points pour le classement général et la médaille d'or dans cette discipline. Planet 3DNow! reçoit donc 90 points pour le classement général et la médaille d'argent dans cette discipline. Team China reçoit donc 80 points pour le classement général et la médaille de bronze dans cette discipline. Toutes nos félicitations aux vainqueurs! Am 19.05.2018 um 0:00 Uhr (UTC) endete die Disziplin Stadtlauf beim Projekt Asteroids@home. Das vollständige Ergebnis ist hier zu finden: https://www.seti-germany.de/boinc_pentathlon/statistiken/challenge.php?challengeid=4&lang=de. Somit erhält SETI.USA 100 Punkte für die Gesamtwertung und die Goldmedaille in dieser Disziplin. Somit erhält Planet 3DNow! 90 Punkte für die Gesamtwertung und die Silbermedaille in dieser Disziplin. Somit erhält Team China 80 Punkte für die Gesamtwertung und die Bronzemedaille in dieser Disziplin. The project NumberFields@home in the discipline Marathon ended on 19 May 2018 at 0.00 (UTC). The final results are available at https://www.seti-germany.de/boinc_pentathlon/statistiken/challenge.php?challengeid=1&lang=en. Le 19/05/2018 à 0h00 (UTC) s’est terminée la discipline Marathon avec le projet NumberFields@home. Vous trouverez le résultat final pour ce projet sur cette page: https://www.seti-germany.de/boinc_pentathlon/statistiken/challenge.php?challengeid=1&lang=fr. Am 19.05.2018 um 0:00 Uhr (UTC) endete die Disziplin Marathon beim Projekt NumberFields@home. Das vollständige Ergebnis ist hier zu finden: https://www.seti-germany.de/boinc_pentathlon/statistiken/challenge.php?challengeid=1&lang=de. As we look into the faces we see how tired and drawn they are. Once again, the last few metres will demand everything from the competitors. However, they’ve got to persevere as two disciplines are still outstanding. The third Gold this year is going to SUSA who managed to cross the finish line at a comfortable pace. SG secured Silver with a brilliant final spurt and didn’t leave Team China a sliver of a chance. TC thus collected their third individual Bronze medal overall. Congratulations. The final spurt of CNT turned out to be a bit meagre so that even #4 was wobbling. However, P3D didn’t pull it off on the home straight and had to contend with #5. [H] went over the finish line at #6 ahead of TAAT who at #7 stayed true to their form. AF (#8), OCN (#9) and RKN (#10) didn’t get scorched in the end. LTT Forums finished at #11 in the field which was thus their best individual standing. Although Meisterkühler tried to intervene it didn’t make a difference for them in the end at #12. BOINC@MIXI managed to salvage #13 as BOINC@AUSTRALIA (#14) threatened with excess tempo. The same goes for Crunching@EVGA whose final spurt resulted in #15. In the end, neither 2ch (#16) nor BOINC.Italy (#17) were able to follow such concentrated power. For BOINC@Poland rank #18 didn’t get torched because neither USA (#19) nor AMD Users (#20) were in a position to start the fire. In addition, both LITOMYSL (#21) and UK BOINC Team (#22) were able to cross the finish line in a relaxed manner. That’s not something the teams behind could do. On the home straight, BOINC Confederation grabbed #23 and gave BOINCstats (#24) quite a shock. And behind, Ukraine (#25) had a fulminant last day and gave Crystal Dream no chance. SETIKAH cross the finish line at #27, followed by BOINC@Pfalz (#28). The expected attack by U.S. Army (#29) did not happen in the end. That allowed even Das Kartell (#30) to move closer. Chinese Dream arrived at #31 and didn’t seem to be getting on too well with GPUs. What’s going to happen here in the next few hours? SUSA’s advantage is large and to catch up to them would be a feat compared to climbing Mount Everest. P3D (#2) are currently still trying to make the impossible possible. However, there’s serious danger behind in double measure. TC (#3) and [H] (#4) could potentially shake up the podium with a powerful final sprint and thus cause the Green Planet to quickly wilt. SG should be safe at #5 as well as OCN at #6. TAAT (#7) can’t be sure yet that CNT aren’t going to decide to shake off #8 and AF at (#9) aren’t that impossibly far behind. The last team able to push their way into the Top 10 will be decided between MK (#10) and AMD Users (#11). Both are only separated by a whisker. Who knows, even RKN (#12) might still harbour ambitions, it wouldn’t be impossible. On the other hand, #13 seems to constitute maximum outcome for BOINC@AUSTRALIA #13. They’ve so far been able to keep USA behind them at #14 without any great difficulty whereby the Americans are almost completely exhausted standing up. Chinese Dream (#15) could still use that to their advantage. Crunching@EVGA were already made to feel the power of the Chinese and currently find themselves at #16 and should at least not let BOINC.Italy (#17) out of sight. It might get tight on the finish line for the Ukraine, currently at #18, as BOINC@MIXI (#19) have powered a little closer. At this time, 2ch have secured #20. Behind are UK BOINC Team (#21), BOINCstats (#22), LTT Forums (#23) and Das Kartell (#24), all keeping together. The Brits have a small advantage, the trio behind don’t leave each other any leeway. The organisers would do well to calibrate the camera for the photo finish. LITOMYSL are holding on to #25 and should be safe from Crystal Dream (#26). The Dreamers’ point of departure now looks a bit uncomfortable as BOINC@Poland (#27), SETIKAH (#28) and BOINC Confederation (#29) are all perfectly capable of an attack. This would be possible but not expected from U.S. Army (#30) and BOINC@Pfalz (#31). It continues to be difficult to work out the standard track at the Pentathlon. SUSA lead and will most likely make the race safe with an expected spurt at the end but what’s happening behind? P3D cannot be assured of Silver as TC (#3) cannot be dismissed and SG (#4) and CNT (#5) have most likely still got their pockets full. AF #6 can enjoy the spectacle from the Rooster’s best vantage point. TAAT (#7) won’t most likely pose a threat and hope that [H] (#8) don’t return. It took just one twitch of their muscles for RKN (#9) to whizz past OCN (#10), LITOMYSL (#11) and USA (#12). There appears to be no going back or forth for BOINC.Italy (#13). This gives the Italians a great spot from where to view the action behind them. SETIKAH (#14) have come under pressure from MK (#15) and who knows, maybe even BOINC@AUSTRALIA (#16) can get back into the mix. The kangaroos have just managed to rush past Chinese Dream (#17). Behind then follow Crunching@EVGA (#18), Ukraine (#19) and AMD Users (#20). BOINC@Poland are currently at #21 and need to guard against BOINCstats (#22). And even BOINC@MIXI (#23), 2ch (#24), Crystal Dream (#25) and also Das Kartell (#26) will not be giving up quite so easily. The end of the field is led by LTT Forums (#27) who managed to slip past UK BOINC Team (#28). Lying in wait behind are BOINC Confederation (#29). The duo of U.S. Army (#30) and BOINC@Pfalz (#31) are clinging to each other and can see SETI.Bitola (#32) far behind them. Have all the medals been allocated? At least Gold will certainly go to SUSA. Otherwise the distances seem large but as the City Run could get a bit chaotic, nothing can be dismissed at this stage. P3D will want to defend #2 but TC (#3) might want to put a spoke in their wheel. Even SG (#4) have still got a chance to win Bronze but will need others to help with that. However, CNT should do everything to defend #5 as [H] (#6) could still affect a change of places here. TAAT at #7 must continue to keep an eye on AF (#8). On the other hand, OCN (#9) have lost a little ground and must put aside any further ambitions they might have had. RKN will most likely cross the finish line at #10. It’s looking good for MK (#11) but as BOINC@AUSTRALIA (#12) are beginning to excel at the City Run, it could still get pretty tight here. Behind, USA (13) and BOINC.Italy (#14) are only separated by one position which will make a long day for both. Behind are Crunching@EVGA at #15. Neck and neck continue Chinese Dreams (#16), LTT Forums (#17) and AMD Users (#18). BOINC@Poland at #19 would be able to push up to their ranks but their previous performance leaves that in doubt. LITOMYSL (#20) have nabbed 2ch (#21) and removed themselves further from Ukraine (#22) and SETIKAH (#23). Behind, on equal points, close together and fighting it out are UK BOINC Team (#24) and BOINCstats (#25). It remains to be seen if that continues or if there isn’t a split on the cards soon. Das Kartell must fear for #27 as BOINC Confederation (#28) have closed in and are now in overtaking distance. Although Crystal Dream (#29) are trying to contain Confederation, it remains to be seen if they can succeed. U.S. Army (#30), BOINC@Pfalz (#31) and SETI.Bitola (#32) are bringing up the rear of the field. - Who will claim the medal in the City Run? - Can [H] take Bronze in the Marathon? - Must SG be content with sheet metal in the Overall Standings? As you can see, it remains exciting at the BOINC Pentathlon. Les visages que nous regardons sont épuisés. Les derniers mètres exigent encore des participants de tout donner. Mais ils doivent encore tenir, il reste encore deux disciplines. La troisième médaille d'or de l'année va à SUSA, qui a pu trotter à travers l'arrivée avec une avance confortable. Grâce à un brillant sprint final SG a récupéré l'argent sans laisser la moindre chance à Team China. TC a ainsi décroché sa troisième médaille de bronze individuelle. Toutes nos félicitations! Le sprint final de CNT était un peu mou et la 4e place vacillait, mais P3D n'a pas réussi à doubler CNT dans la dernière ligne droite et doit donc se contenter de la 5e place. [H] a passé la ligne d'arrivée en 6e, devant TAAT qui reste fidèle à sa 7e place. Il n'y a pas eu de post-combustion non plus pour l'AF (#8), OCN (#9) et RKN (#10). Dans le peloton, LTT Forums a atteint la 11e place et ainsi son meilleur classement individuel. Les Meisterkühler ont certes tenté d'y remédier, mais finalement cela n'a rien changé à leur 12e place. BOINC@MIXI s'est sauvé au rang 13 à la dernière minute, car BOINC@AUSTRALIA (#14) montrait une sacrée montée en puissance. Cela s'appliquait aussi à Crunching@EVGA, dont le sprint final a rapporté la 15e place. Au final, ni 2ch (#16), ni BOINC.Italy (#17) n'ont réussi à suivre ce concentré d'énergie. Pour BOINC@Poland, la 18e place ne s'est pas transformée en rêve de cendre, entre autres parce que ni USA (#19), ni les AMD Users (#20) n'étaient capables d'allumer un feu. LITOMYSL (#21) et UK BOINC Team (#22) ont également pu traverser la ligne d'arrivée de manière décontractée. Ce n'était pas le cas des équipes suivantes: Sur la ligne d'arrivée, BOINC Confederation a décroché la 23e place et a ainsi surpris BOINCstats (#24). Derrière, l'Ukraine (#25) n'ai laissé aucune chance à Crystal Dream grâce à une brillante dernière journée. Sont arrivés ensuite SETIKAH au rang 27, suivie par BOINC@Pfalz (#28). L'attaque de l'U.S. Army (#29) ne s'est pas produite, ce qui a permis à Das Kartell (#30) de s'approcher. Chinese Dream est arrivée 31e et ne semble pas trop aimer les GPU. Que se passera-t-il au cours des prochaines heures? L'avance de SUSA est grande et vouloir la rattraper s'apparente à gravir l'Everest. Pour l'instant, P3D (#2) tente encore tout pour rendre possible l'impossible. Mais un sérieux danger arrive par l'arrière, même un double danger: avec un puissant sprint final TC (#3) et [H] (#4) peuvent encore bien secouer le podium et faire rapidement faner la Planète verte. La 5e place devrait être acquise à SG, tout comme la 6e à OCN. TAAT (#7) ne peut toujours pas être certaine que CNT ne veuille pas se débarrasser du #8. L'AF (#9) n'est pas vraiment très loin non plus. La dernière équipe à entrer dans le top10 se décidera entre MK (#10) et les AMD Users (#11). Toutes deux ne sont séparées que par un souffle. Il se pourrait que RKN (#12) ait d'autres ambitions, ce n'est pas impossible. En revanche, la 13e place pourrait être le maximum pour BOINC@AUSTRALIA . Elle maintient facilement USA derrière elle au rang 14 jusqu'à présent, les Américains étant pratiquement K.O. debout. Chinese Dream (#15) pourrait encore en profiter. Crunching@EVGA a déjà senti la puissance des Chinois et se retrouve actuellement au rang 16. Elle ne devrait pas quitter BOINC.Italy (#17) des yeux. Pour l'Ukraine (#18) cela pourrait encore devenir serré sur la ligne d'arrivée, car BOINC@MIXI (#19) s'est approchée. Pendant ce temps, 2ch sécurise la 20e place. Derrière, on trouve en groupe UK BOINC Team (#21), BOINCstats (#22), LTT Forums (#23) et Das Kartell (#24). Certes, les Britanniques ont une légère avance, mais le trio derrière ne se fait pas de cadeau. Il est grand temps que les Organisateurs ajustent la caméra pour la photo-finish. LITOMYSL se maintient au rang 25 et devrait être en sécurité de Crystal Dream (#26). Pour les Rêveurs, la situation de base n'est pas aussi agréable, car BOINC@Poland (#27), SETIKAH (#28) et BOINC Confederation (#29) sont tout à fait capables d'attaquer. Ce qui serait possible mais inattendu chez U.S. Army (#30) et BOINC@Pfalz (#31). La piste standard du Pentathlon est toujours aussi difficile à calculer. SUSA mène et devrait rendre les choses très claires avec un sprint attendu. Mais que va-t-il se passer derrière? P3D ne peut pas être sûre de la médaille d'argent, car personne ne devrait faire une croix sur TC (#3). Quant à SG (#4) et CNT (#5), elles ont sûrement encore les poches pleines. Il semblerait que l'AF (#6) puisse observer tout cela en toute sécurité depuis son tas de paille. TAAT (#7) n'est sûrement pas un danger et elle peut espérer que [H] (#8) ne revienne pas. RKN (#9) a eu un sursaut musculaire et a dépassé OCN (#10), LITOMYSL (#11) et USA (#12) à toute bringue. On dirait que les choses sont bloquées pour BOINC.Italy (#13). Les Italiens peuvent ainsi profiter pleinement du spectacle qui se déroule derrière eux. SETIKAH (#14) est sous pression de MK (#15) et peut-être que BOINC@AUSTRALIA (#16) peut encore les rejoindre. Les kangourous viennent juste de dépasser Chinese Dream (#17). Derrière suivent Crunching@EVGA (#18), Ukraine (#19) et AMD Users (#20). BOINC@Poland est 21e et devrait se méfier de BOINCstats (#22). BOINC@MIXI (#23), 2ch (#24), Crystal Dream (#25) voire Das Kartell (#26) ne vont pas abandonner si vite non plus. La queue de peloton est désormais menée par LTT Forums (#27) qui a réussi à passer UK BOINC Team (#28). Derrière nous trouvons aux aguets BOINC Confederation (#29). Le duo U.S. Army (#30) et BOINC@Pfalz (#31) se fait des câlins ici aussi et voient loin derrière elles SETI.Bitola (#32). Les médailles sont-elles déjà distribuées? Au moins l'or est sûr pour SUSA. Pour le reste, les écarts semblent grands, mais comme la Course Urbaine peut devenir très chaotiques, je n'exclus rien. P3D va vouloir défendre sa 2e place, mais TC (#3) pourrait contrecarrer ses projets. SG (#4) aussi a encore des chances de décrocher le bronze, mais elle a besoin de l'aide des autres pour ça. En revanche, CNT devrait tout faire pour défendre sa 5e place, car [H] (#6) peut encore déclencher un changement de place. TAAT (#7) doit continuer à surveiller l'AF (#8). OCN (#9), en revanche, a perdu un peu de terrain et devrait donc avoir réduit un peu ses ambitions. RKN passera sûrement l'arrivée en 10e. Pour MK (#11), les choses ont l'air bonnes, mais si BOINC@AUSTRALIA (#12) se surpasse à la Course Urbaine, cela pourra encore devenir très serré. Derrière, USA (#13) et BOINC.Italy (#14) ne sont séparées que par une position - la journée sera encore longue pour ces deux équipes... Crunching@EVGA se retrouve derrière, au rang 15. Un tête-à-tête se joue entre Chinese Dream (#16), LTT Forums (#17) et les AMD Users (#18). BOINC@Poland, au rang 19, serait certainement capable d'avancer jusqu'à ces lignes, mais le déroulement passé me fait douter. LITOMYSL (#20) a chopé 2ch (#21) et s'éloigne ainsi aussi de l'Ukraine (#22) et de SETIKAH (#23). Nous trouvons ensuite les ex æquo, UK BOINC Team (#24) et BOINCstats (#25) enlacés. Voyons si cela restera ainsi ou si nous allons bientôt assister à un divorce. Das Kartell doit craindre pour sa 27e place, car BOINC Confederation (#28) est arrivée à portée de tir. Crystal Dream (#29) tente certes de retenir la Confédération, mais il reste à voir si elle réussit. U.S. Army (#30), BOINC@Pfalz (#31) et SETI.Bitola (#32) ferment la marche. Quelles autres questions y a-t-il? - Qui décrochera les médailles à la Course Urbaine? - [H] peut-elle décrocher le bronze au Marathon? - SG devra-t-elle se contenter de la médaille en chocolat au général? Vous voyez, le BOINC Pentathlon reste captivant. Es sind erschöpfte Gesichter, in die wir schauen können. Auf den letzten Metern wird nochmal alles von den Teilnehmern abverlangt. Doch noch müssen sie durchhalten, denn zwei Disziplinen stehen noch aus. Das dritte Gold in diesem Jahr geht an SUSA, die mit einem komfortablen Vorsprung ins Ziel traben konnten. Mit einem fulminanten Endspurt sicherte SG Silber ab und ließ so Team China nicht den Hauch einer Chance. TC holte sich damit die dritte Einzelbronzemedaille insgesamt. Herzlichen Glückwunsch. Etwas mau viel der Endspurt von CNT aus und so schwankte #4 sogar. Doch schaffte es P3D auf der Zielgerade nicht und muss sich mit #5 begnügen. Auf #6 ging [H] über die Ziellinie, vor TAAT, die mit #7 ihrer Linie treu bleiben. Auch für AF (#8), OCN (#9) und RKN (#10) brannte am Ende nichts mehr an. LTT Forums erlief sich im Feld #11 und damit die besten Einzelplatzierung. Die Meisterkühler versuchten zwar, dies noch zu ändern, aber dies änderte letztlich an #12 nichts mehr. BOINC@MIXI rettete sich in letzter Sekunde auf #13, denn BOINC@AUSTRALIA (#14) hatte einen kräftigen Tempoüberschuss. Dies traf auch auf Crunching@EVGA zu, deren Endspurt #15 einbrachte. Dieser geballten Kraft konnten am Ende weder 2ch (#16) noch BOINC.Italy (#17) folgen. Für BOINC@Poland brannte #18 nicht mehr an, auch weil weder USA (#19) noch AMD Users (#20) in der Lange waren Feuer zu legen. Auch LITOMYSL (#21) und UK BOINC Team (#22) konnten entspannt ins Ziel laufen. Dies stand für die Teams dahinter nicht auf der Agenda. Auf der Ziellinie holte sich die BOINC Confederation #23 und schockte so BOINCstats (#24). Und dahinter ließ die Ukraine (#25) mit einem fulminanten Schlusstag Crystal Dream keine Chance. Auf #27 lief dann SETIKAH ein, gefolgt von BOINC@Pfalz (#28). Der Angriff der U.S. Army (#29) bleib aus. So konnte sogar Das Kartell (#30) näher rücken. Chinese Dream geht auf #31 ein und hat es wohl nicht so mit GPUs. Was passiert hier die nächsten Stunden? Der Vorsprung von SUSA ist groß und diesen aufzuholen kommt schon einer Mount-Everest-Besteigung gleich. Noch versucht P3D (#2) alles, um das Unmögliche doch noch möglich zu machen. Allerdings droht von hinten ernste Gefahr und das gleich doppelt. TC (#3) und [H] (#4) können mit einem kräftigen Endspurt das Podium noch kräftig durchschütteln und damit den grünen Planeten schnell welken lassen. SG dürfte #5 nicht mehr zu nehmen sein, ebenso wie OCN #6. TAAT (#7) kann sich weiterhin nicht sicher sein, dass CNT nicht doch noch #8 abschütteln möchte und unmöglich weit weg liegt AF (#9) nun auch wieder nicht. Wer es als letztes Team in die Top 10 schafft, wird sich zwischen MK (#10) und AMD Users (#11) entscheiden. Beide trennt nur ein Hauch. Möglicherweise hat auch RKN (#12) noch Ambitionen, unmöglich wäre es nicht. Dagegen dürfte #13 für BOINC@AUSTRALIA das Maximum darstellen. Die USA hält man bisher locker hinter sich auf #14, wobei die Amerikaner fast stehend k.o. sind. Dies könnten Chinese Dream (#15) noch für sich nutzen. Crunching@EVGA hat bereits die Kraft der Chinesen zu spüren bekommen und findet sich aktuell auf #16 wieder und sollte zumindest BOINC.Italy (#17) nicht aus den Augen lassen. Für die Ukraine auf #18 könnte es auf der Ziellinie doch noch eng werden, BOINC@MIXI (#19) hat sich näher herangearbeitet. Derweil sichert 2ch #20 ab. Dahinter finden sich das UK BOINC Team (#21), BOINCstats (#22), LTT Forums (#23) und das Kartell (#24) zusammen. Die Briten haben zwar einen leichten Vorsprung, das Trio dahinter schenkt sich nichts. Die Organisatoren sollten dringend die Fotokamera für das Fotofinish justieren. LITOMYSL hält #25 und dürfte vor Crystal Dream (#26) sicher sein. Für die Träumer ist die Ausgangslage nicht ganz so angenehm, denn BOINC@Poland (#27), SETIKAH (#28) und die BOINC Confederation (#29) sind durchaus in der Lage zu attackieren. Möglich aber unerwartet wäre das wohl bei U.S. Army (#30) und BOINC@Pfalz (#31). Schwer auszurechnen ist weiter die Standardstrecke des Pentathlon. SUSA führt und wird wohl mit einem zu erwartenden Spurt am Ende alles klar machen, doch was dahinter passiert? P3D kann sich Silber nicht sicher sein, denn TC (#3) sollte niemand abschreiben und auch SG (#4) und CNT (#5) haben sicher noch volle Taschen. AF #6 kann sich das wohl in Ruhe vom Hahnenhaufen ansehen. TAAT (#7) ist sicher keine Gefahr und kann hoffen das [H] (#8) nicht zurückkommt. Mit den Muskeln gezuckt hat RKN (#9) und ist so an OCN (#10), LITOMYSL (#11) und USA (#12) vorbeiflitzt. Für BOINC.Italy (#13) geht es wohl weder nach vorn noch nach hinten. So haben die Italiener eine gute Aussicht was sich dahinter abspielt. SETIKAH (#14) ist unter Druck von MK (#15) geraten und vielleicht kann auch noch BOINC@AUSTRALIA (#16) mitmischen. Die Kängurus haben es gerade vorbei an Chinese Dream (#17) geschafft. Dahinter folgen Crunching@EVGA (#18), Ukraine (#19) und AMD Users (#20). BOINC@Poland steht auf #21 und sollte sich hüten vor BOINCstats (#22). Und auch BOINC@MIXI (#23), 2ch (#24), Crystal Dream (#25) und gar Das Kartell (#26) werden nicht so einfach aufgeben. Das Ende des Feldes führt nun LTT Forums (#27) an, die es vorbei an UK BOINC Team geschafft (#28) haben. Dahinter folgt in Lauerposition die BOINC Confederation (#29). Das Duo U.S. Army (#30) und BOINC@Pfalz (#31) kuschelt sich auch hier aneinander und sieht weit hinter sich SETI.Bitola (#32). Sind die Medaillen verteilt? Zumindest Gold ist SUSA sicher. Ansonsten mögen die Abstände groß erscheinen, aber da es im Stadtlauf sehr chaotisch werden kann, schließe ich nichts aus. P3D wird #2 verteidigen wollen, da könnte aber TC (#3) einen Strich durch die Rechnung machen. Auch SG (#4) hat noch Chancen auf Bronze, braucht aber Hilfe von anderen. CNT sollte dagegen alles tun, um #5 zu verteidigen, denn [H] (#6) kann hier noch für einen Platztausch sorgen. TAAT auf #7 muss weiter auf AF (#8) aufpassen. OCN (#9) dagegen hat etwas Boden verloren und dürfte damit weitere Ambitionen bei Seite gelegt haben. RKN wird sicher auf #10 durchs Ziel gehen. Für MK (#11) sieht es gut aus, doch sollte BOINC@AUSTRALIA (#12) beim Stadtlauf über sich hinaus wachsen, wird es nochmal richtig knapp werden. Dahinter trennt USA (#13) und BOINC.Italy (#14) nur eine Position, das wird für beide ein langer Tag. Dahinter steht Crunching@EVGA auf #15. Kopf an Kopf geht es weiter zwischen Chinese Dreams (#16), LTT Forums (#17) und AMD Users (#18) zu. BOINC@Poland auf #19 wäre durchaus in der Lage, in diese Reihen vorzudringen, aber der bisherige Verlauf lässt mich zweifeln. LITOMYSL (#20) hat sich 2ch (#21) geschnappt und setzt sich so weiter von der Ukraine (#22) und SETIKAH (#23) ab. Punktgleich dahinter, also eng umschlungen, sind UK BOINC Team (#24) und BOINCstats (#25) miteinander zu Gange. Mal sehen ob das so bleibt oder ob bald eine Scheidung ansteht. Das Kartell muss um #27 fürchten, denn die BOINC Confederation (#28) ist in Schlagdistanz gekommen. Crystal Dream (#29) versucht zwar, Confederation zu halten, es bleibt offen ob das gelingt. U.S. Army (#30), BOINC@Pfalz (#31) und SETI.Bitola (#32 schließen das Feld ab. Was gibt es so noch für Fragen? - Wer holt sich die Medaillen beim Stadtlauf? - Kann [H] Bronze beim Marathon holen? - Muss SG sich in der Gesamtwertung mit Blech zufrieden geben? Ihr seht, es bleibt spannend beim BOINC Pentathlon. The project PrimeGrid in the discipline Cross Country ended on 18 May 2018 at 0.00 (UTC). The final results are available at https://www.seti-germany.de/boinc_pentathlon/statistiken/challenge.php?challengeid=5&lang=en. Hence, SETI.Germany receives 90 points for the overall rankings and the silver medal in this discipline. Le 18/05/2018 à 0h00 (UTC) s’est terminée la discipline Cross-country avec le projet PrimeGrid. Vous trouverez le résultat final pour ce projet sur cette page: https://www.seti-germany.de/boinc_pentathlon/statistiken/challenge.php?challengeid=5&lang=fr. SETI.Germany reçoit donc 90 points pour le classement général et la médaille d'argent dans cette discipline. Am 18.05.2018 um 0:00 Uhr (UTC) endete die Disziplin Querfeldein beim Projekt PrimeGrid. Das vollständige Ergebnis ist hier zu finden: https://www.seti-germany.de/boinc_pentathlon/statistiken/challenge.php?challengeid=5&lang=de. Somit erhält SETI.Germany 90 Punkte für die Gesamtwertung und die Silbermedaille in dieser Disziplin. The penultimate day of the 9th Pentathlon is under way and it could be the day of the dragon. However, a bit more about that below. Today is decision day at Cross Country and tomorrow is the day of the Grand Finale. I hope that you are ready? P3D (#5) are theoretically still within reach of the podium but the graphic power of the other teams appears mightier. But maybe the Green Planet will surprise us with green power. On the other hand it’s not quite clear what [H] (#6) are still planning to achieve. However, we can’t rule out a big surprise from them. TAAT continue happily at #7 and must be hoping that AF are equally happy with #8. The defending champion of the Cross Country, OCN, can only be found at #9 at the moment. Don’t they like numbers or is there more to come? Behind, RKN should be fairly secure at #10 as LTT Forums (#11) are already very far away with an equally large margin to the rear. In the fight over #12, MK have managed to put distance between BOINC@MIXI (#13), BOINC@AUSTRALIA (#14) and 2ch (#15). However, the margins aren’t large enough to provide a sense of security. This could provide a chance for BOINC.Italy (#17) and Crunching@EVGA (#16). They had to break off for now but a well timed end offensive could turn everything upside down. It appears as if BOINC@Poland are currently trying to secure #18, however, USA (#19) are slowly beginning to catch up. A good performance in the last few hours has assured #20 for AMD Users as LITOMYSL (#21) and UK BOINC Team (#22) are noticeably behind and haven’t drawn attention to themselves with sudden activity. The decision of who will be allowed to claim #23 has not yet been taken. BOINCstats (#23) have just set off at a pace but BOINC Confederation (#24) are not to be shaken off lightly. Rank 25 is not yet secure for Ukraine as Crystal Dream (#26) and SETIKAH (#27) are just too close. BOINC@Pfalz had risked a brave attack on USA and were thus rewarded with #28. The Americans must be careful that they don’t lose #29 as well because Das Kartell (#30) is running faster than them. On this long track, most postions appear to have been secured already. Short spontaneous bursts will not be expected regularly as the margins are considerably larger. However, those who have prepared well in the last few days may find themselves justly rewarded. SUSA continue to lead the field and once again extend their distance to P3D. However, there has been a change behind them. TC have run to #3 and have thus taken the Bronze medal out of the hand of [H]. Will there now follow a counter attack? If not, that would be a bitter blow for [H]. What else is new? BOINC@AUSTRALIA have run up to rank #13 and thus relegated USA to #14. And at #19 we can now find BOINC@MIXI who have pushed 2ch back again. At the end of the field, BOINC Confederation have reared up and snatched #30 by overtaking BOINC@Pfalz. SUSA ahead of P3D, the familiar duo at the top. However, behind them, TC have struck once again. With a mighty interim spurt, the Dragons powered past SG (#4) to #3. Can the blue-yellow team retaliate? CNT were a victim of the Dragon but as [H] (#7) have lost momentum, they were able to remain at #5. AF have pushed up to #6 and appear to be profiting from [H] diverting resources to the Marathon. That could mean a chance for TAAT, allowing them to reclaim #7. OCN have succeeded in relegating LITOMYSL to #10 which gives them #9. BOINC.Italy (#13) have shown some weakness in the last few hours which their rivals at USA (#11) and RKN (#12) boldly used to their advantage. SETIKAH (#14) are currently not posing a threat to the Italians despite having nabbed MK (#15) and cutting loose from Chinese Dream (#16). Behind, BOINC@AUSTRALIA (#17) are beginning to come closer and will be expected to be passing by. That will most likely no longer be possible for Crunching@EVGA (#18). Ukraine secure #19 even though AMD Users (#20) have not yet given up. Meanwhile, BOINC@Poland (#21) and BOINCstats (#22) have overtaken the duo of 2ch (#23) and Das Kartell (#23) who have accomplished the feat of having the same points. There are no changes behind: Crystal Dream (#25) only ahead by a very small margin of BOINC@MIXI (#26) and UK BOINC Team (#27), LTT Forums (#28), BOINC Confederation (#29), U.S. Army (#30), BOINC@Pfalz (#31) and SETI.Bitola (#32). SUSA are close to Overall Victory and it shouldn’t be possible to take Silver away from P3D. However, there’s still a hard contest for Bronze. TC have pushed onto the Bronze rank with their increased performance at the Marathon and the City Run. It will now be difficult for SG (#4) to recover from this without any help. However, as [H] (#5) had to break off, the Germans can at least be assured of rank 4 at this time. On the other hand, CNT (#6) will already have rank 5 in their sights. TAAT hold on to #7 but must keep an eye on AF (#8) and OCN (#9). On the other hand, it shouldn’t still be possible to take #10 away from RKN. Behind, BOINC@AUSTRALIA are continuing with increased pace and now already at #12. Could Meisterkühler (#11) still be a threat to the Australians? We will see. But let’s not forget about USA (#13) and BOINC.Italy (#14). Both are still within striking distance. Behind there are no changes at Crunching@EVGA (#15), Chinese Dream (#16), LTT Forums (#17) and AMD Users (#18). I can only hope that this is the calm before the storm. BOINC@Poland at #19 will be watching without much excitement. LITOMYSL (#20) were able to use a small weakness of 2ch (#21) to their advantage whilst Ukraine (#22) managed to detach from BOINC@MIXI (#23) under their own steam. SETIKAH have good chances to retain #24. Trembling behind, UK BOINC Team (#25) must fear an attack from BOINCstats (#26). Das Kartell (#27), Crystal Dream (#28), BOINC Confederation (#29), U.S. Army (#30), BOINC@Pfalz (#31) and SETI.Bitola (#32) are too far away for that. - Can SG claim Silver at the Cross Country? - Will [H] retaliate at the Marathon? - Will TAAT climb back up to #7 at the City Run? L'avant-dernier jour du 9e Pentathlon est en cours et il pourrait devenir le jour du dragon. Mais vous en saurez davantage plus bas. C'est aujourd'hui que tombent les résultats au Cross-country et demain nous assisterons à la grande finale. J'espère que vous êtes prêts? Au fond, P3D (#5) est toujours à portée du podium, mais la puissance graphique des autres équipes semble plus forte. Peut-être que la Planète verte nous surprendra avec son énergie verte. En revanche, il reste à voir ce que [H] (#6) fournira encore. Ils peuvent parfaitement encore nous réserver une surprise. TAAT continue à se sentir bien au rang 7 et va sûrement espérer que l'AF se satisfera de même de son rang 8. Le tenant du titre au Cross-country, OCN, ne se classe que 9e actuellement. Est-ce qu'ils n'aiment pas les nombres ou est-ce qu'il y a encore quelque chose à venir? Derrière, RKN semble assez certaine de son rang 10, car LTT Forums (#11) est vraiment très loin derrière, elle a également une grande avance sur son poursuivant. Dans la bataille pour la 12e place, MK se place devant BOINC@MIXI (#13), BOINC@AUSTRALIA (#14) et 2ch (#15). Mais les écarts ne sont pas assez grands pour s'imaginer en sécurité. Cela pourrait être une chance pour BOINC.Italy (#17) et Crunching@EVGA (#16). Elles ont certes dû laisser filer un peu, mais une offensive finale bien minutée peut tout renverser. BOINC@Poland semble actuellement vouloir sécuriser le rang 18, mais USA (#19) commence à remonter lentement. Une bonne performance au cours des dernières heures devrait assurer la 20e place aux AMD Users, car LITOMYSL (#21) et UK BOINC Team (#22) sont nettement en retrait et ne se sont pas encore fait remarquer par des actions soudaines. La décision de la 23e place n'est pas encore prise: BOINCstats (#23) vient de s'y installer, mais BOINC Confederation (#24) ne lâche rien. La place 25 n'est pas non plus sûre pour l'Ukraine. Crystal Dream (#26) et SETIKAH (#27) sont trop proches. BOINC@Pfalz avait tenté une courageuse attaque sur USA et est récompensée par la 28e place. Les Américains doivent maintenant veiller à ne pas non plus perdre la 29e place, car Das Kartell (#30) est également plus rapide. Sur la piste longue, la plupart des positions devrait être attribuée. Il ne faut pas trop s'attendre à des actions à court terme car les écarts sont déjà un peu plus importants. En revanche, ceux qui se sont bien préparés au cours des derniers jours pourraient être récompensés. SUSA continue à mener le peloton et augmente son avance sur P3D. Mais derrière, il y a quand même eu un changement: TC est monté à la 3e place et a ainsi arraché la médaille de bronze des mains de [H]. Y aura-t-il une contre-attaque? Si non, ce serait vraiment amer pour [H]. Quoi de neuf? BOINC@AUSTRALIA a progressé au rang 13 et a ainsi repoussé USA au rang 14. Et au rang 19 nous trouvons désormais BOINC@MIXI qui en a encore évincé 2ch. Tout à fait à la fin, BOINC Confederation s'est cabrée et a décroché la 30e place en passant devant BOINC@Pfalz. SUSA devant P3D - le duo habituel en tête. Mais derrière, TC a encore frappé. Grâce à un énorme sprint intermédiaire, les dragons sont passés devant SG (#4) et se sont installés sur la 3e place. Les Bleu et Jaune pourront-ils riposter? L'une des victimes du dragon était CNT, mais comme [H] (#7) a perdu de son élan, elle a réussi à garder le rang 5. L'AF s'est glissée sur la 6e place et profite sûrement aussi du fait que [H] déplace des forces vers le Marathon. Cela pourrait être la chance de TAAT pour reconquérir sa 7e place. OCN a réussi à renvoyer LITOMYSL au rang 10, ce qui signifie #9 pour elle. BOINC.Italy (#13) a eu un petit coup de mou ces dernières heures, et les concurrents d'USA (#11) et RKN (#12) en ont froidement profité. SETIKAH (#14) ne représente pas encore de danger pour les Italiens, même si elle s'est fait MK (#15) et a ainsi réussi à se détacher un peu plus de Chinese Dream (#16). Derrière, BOINC@AUSTRALIA (#17) arrive à pas feutrés et devrait probablement encore passer. Cela ne sera plus possible pour Crunching@EVGA (#18). L'Ukraine sécurise la 19e place, même si les AMD Users (#20) n'abandonnent pas encore. Entre-temps, BOINC@Poland (#21) et BOINCstats (#22) ont doublé le duo 2ch (#23) et Das Kartell (#23), qui réussissent le tour de force d'être parfaitement ex æquo. Derrière il n'y a pas de changement: Crystal Dream (#25) de justesse devant BOINC@MIXI (#26) et UK BOINC Team (#27), LTT Forums (#28), BOINC Confederation (#29), U.S. Army (#30), BOINC@Pfalz (#31) et SETI.Bitola (#32). SUSA est à l'aube d'une victoire au général et l'argent ne semble plus pouvoir être arraché à P3D non plus. Mais la bataille pour le bronze est encore acharnée. Grâce à son amélioration au Marathon et à la Course Urbaine, TC s'est glissée sur la 3e place. Pour SG (#4) il sera difficile de revenir sans aide. Mais comme [H] (#5) doit laisser filer, la 4e place semble au moins assurée pour les Allemands. En revanche, CNT (#6) devrait lorgner sur la 5e place. TAAT maintient la 7e place, mais elle doit continuer à se méfier de l'AF (#8) et d'OCN (#9). En revanche, la 10e place devrait être bonne pour RKN. Derrière, BOINC@AUSTRALIA continue sa progression: déjà au rang 12. Les Australiens pourront-ils encore devenir dangereux pour les Meisterkühler (#11)? Nous verrons bien. Mais n'oublions pas USA (#13) et BOINC.Italy (#14). Toutes deux sont toujours à portée de tir. Derrière il n'y a pas de changement chez Crunching@EVGA (#15), Chinese Dream (#16), LTT Forums (#17) et AMD Users (#18). J'espère que c'est le calme avant la tempête. Au rang 19, BOINC@Poland peut contempler tout ça au calme. LITOMYSL (#20) a pu profiter d'une petite faiblesse de 2ch (#21) tandis que l'Ukraine (#22) a réussi à se détacher de BOINC@MIXI (#23) de ses propres forces. SETIKAH a de bonnes chances de garder le rang 24. Derrière, UK BOINC Team (#25) doit craindre l'attaque de BOINCstats (#26). Das Kartell (#27) est trop loin pour ça, tout comme Crystal Dream (#28), BOINC Confederation (#29), U.S. Army (#30), BOINC@Pfalz (#31) et SETI.Bitola (#32). - SG peut-elle décrocher l'argent au Cross-country? - [H] ripostera-t-elle au Marathon? - TAAT réussira-t-elle à revenir à la 7e place à la Course Urbaine? Der vorletzte Tag des 9. Pentathlon läuft und es könnte der Tag des Drachens werden. Aber dazu unten mehr. Heute entscheidet sich das Rennen im Querfeldein und morgen findet das große Finale statt. Ich hoffe, Sie sind bereit? Im Grunde ist P3D (#5) ja noch in Reichweite des Podiums, doch die Grafikpower der anderen Teams erscheint mächtiger. Aber vielleicht überrascht uns ja der grüne Planet mit Green Power. Was dagegen [H] (#6) noch leisten wird, bleibt abzuwarten. Sie könnten aber durchaus noch für eine Überraschung gut sein. TAAT fühlt sich weiter auf #7 wohl und wird hoffen, dass AF mit #8 ebenso zufrieden ist. Der Titelverteidiger im Querfeldein OCN rangiert derzeit nur auf #9. Liegen ihnen Zahlen nicht oder kommt da noch was? Dahinter ist RKN wohl ziemlich sicher auf #10, denn LTT Forums (#11) ist schon sehr weit weg, hat aber auch einen genauso großen Vorsprung nach hinten. Beim Kampf um #12 setzt sich MK von BOINC@MIXI (#13), BOINC@AUSTRALIA (#14) und 2ch (#15) ab. Die Abstände sind aber nicht groß genug um sich in Sicherheit zu wiegen. Dies könnte auch noch eine Chance für BOINC.Italy (#17) und Crunching@EVGA (#16) sein. Sie mussten zwar etwas abreißen lassen, aber eine gut getimte Schlussoffensive kann alles auf den Kopf stellen. BOINC@Poland versucht wohl derzeit, #18 abzusichern, allerdings holt USA (#19) langsam auf. Eine gute Leistung sichert in den letzten Stunden wohl den AMD Users #20, denn LITOMYSL (#21) und das UK BOINC Team (#22) sind doch deutlich zurück und bisher nicht durch plötzliche Aktionen aufgefallen. Die Entscheidung, wer am Ende auf #23 stehen darf, ist noch nicht gefallen. BOINCstats (#23) hat gerade einen Lauf, doch die BOINC Confederation (#24) lässt nicht abreißen. Platz 25 ist auch für die Ukraine nicht gesichert, zu nah sind Crystal Dream (#26) und SETIKAH (#27). Einen beherzten Angriff hatte ja BOINC@Pfalz auf U.S. Army riskiert und wird weiter mit #28 belohnt. Die Amerikaner müssen nun aufpassen, dass sie #29 nicht auch noch verlieren, denn Das Kartell (#30) ist ebenfalls schneller unterwegs. Auf der langen Strecke sind die meisten Positionen sicher schon bezogen. Kurzfristige Aktionen sind nur begrenzt zu erwarten, da die Abstände schon etwas größer sind. Wer allerdings in den letzten Tagen sich gut vorbereitet hat, könnten belohnt werden. SUSA führt das Feld weiter an und baut seinen Vorpressung auf P3D wieder aus. Doch dahinter hat es nun doch einen Wechsel gegeben. TC hat sich auf #3 gelaufen und hat damit [H] die Bronzemedaille aus der Hand genommen. Kommt hier noch ein Gegenangriff? Wenn nicht, wäre es echt bitter für [H]. Was gibt es noch neues? BOINC@AUSTRALIA hat sich auf #13 gelaufen und damit USA auf #14 verdrängt. Und auf #19 ist jetzt BOINC@MIXI zu finden, die 2ch wieder verdrängt haben. Ganz am Ende hat sich die BOINC Confederation aufgebäumt und #30 geschnappt, vorbei an BOINC@Pfalz. SUSA vor P3D, so das gewohnte Duo an der Spitze. Doch dahinter hat TC wieder zugeschlagen. Mit einem mächtigen Zwischenspurt haben sich die Drachen an SG (#4) vorbei auf #3 gesetzt. Können die Blaugelben zurückschlagen? Ein Opfer des Drachens war CNT, da aber [H] (#7) an Schwung verloren hat, können sie #5 halten. AF hat sich auf #6 geschoben und profitiert wohl auch davon, dass [H] Kräfte zum Marathon verlagert. Das könnte die Chance für TAAT sein, um #7 zurückzuerobern. OCN ist es gelungen, LITOMYSL auf #10 zu verweisen, was #9 bedeutet. BOINC.Italy (#13) hat in den letzten Stunden etwas geschwächelt, was die Konkurrenz von USA (#11) und RKN (#12) eiskalt ausgenutzt haben. SETIKAH (#14) stellt derzeit noch keine Gefahr für die Italiener dar, auch wenn sie MK (#15) geschnappt haben und sich so auch weiter von Chinese Dream (#16) lösen konnten. Dahinter arbeitet sich wieder BOINC@AUSTRALIA (#17) heran und wird wohl noch vorbeigehen. Für Crunching@EVGA (#18) dürfte dies nicht mehr möglich sein. Die Ukraine sicher #19, auch wenn die AMD Users (#20) noch nicht aufgeben. Derweil haben BOINC@Poland (#21) und BOINCstats (#22) das Duo 2ch (#23) und Das Kartell (#23) überholt, die das Kunststück vollbringen, exakt punktgleich zu sein. Dahinter gibt es keine Veränderungen: Crystal Dream (#25) sehr knapp vor BOINC@MIXI (#26) und UK BOINC Team (#27), LTT Forums (#28), BOINC Confederation (#29), U.S. Army (#30), BOINC@Pfalz (#31) und SETI.Bitola (#32). SUSA steht vor dem Gesamtsieg und auch P3D dürfte Silber nicht mehr zu nehmen sein. Doch um Bronze wird noch hart gekämpft. TC hat sich durch die Steigerung im Marathon und Stadtlauf auf den Bronzerang geschoben. Für SG (#4) wird es nun schwer, ohne Hilfe zurückzukommen. Da aber [H] (#5) abreißen lassen muss, erscheint zumindest Platz 4 für die Deutschen gesichert. Dagegen wird CNT (#6) wohl noch auf Platz 5 schielen. TAAT hält #7, muss sich aber weiterhin vor AF (#8) und OCN (#9) in Acht nehmen. RKN sollte #10 dagegen nicht mehr zu nehmen sein. Dahinter arbeitet sich BOINC@AUSTRALIA weiter nach vorn, nun schon #12. Ob die Australier noch den Meisterkühlern (#11) gefährlich werden können? Wir werden sehen. Doch vergessen wir nicht USA (#13) und BOINC.Italy (#14). Beide sind immer noch in Schlagdistanz. Dahinter gibt es keine Veränderungen bei Crunching@EVGA (#15), Chinese Dream (#16), LTT Forums (#17) und AMD Users (#18). Ich hoffe doch, dass dies die Ruhe vor dem Sturm ist. In Ruhe ansehen kann sich das BOINC@Poland auf #19. Eine kleine Schwäche von 2ch (#21) hat LITOMYSL (#20) nutzen können, wogegen sich die Ukraine (#22) aus eigener Kraft von BOINC@MIXI (#23) lösen konnte. SETIKAH hat gute Chancen, #24 zu behalten. Dahinter muss das UK BOINC Team (#25) vor dem Angriff von BOINCstats (#26) zittern. Das Kartell (#27) ist dafür zu weit weg, genauso wie Crystal Dream (#28), BOINC Confederation (#29), U.S. Army (#30), BOINC@Pfalz (#31) und SETI.Bitola (#32). - Kann SG Silber beim Querfeldein holen? - Schlägt [H] beim Marathon zurück? - Schafft es TAAT beim Stadtlauf wieder auf #7? The 12th day of the Pentathlon is up and running. The computers groan and smoulder. A few make some funny noises. And some of the hardware has given up the ghost. However, our associated crunchers aren’t suffering quite as much but you can tell that the last few days have been taking their toll on them. Some teams look shattered and yet others as if they’ve only just started. It’s not just the fitness that will be the deciding factor in the end but the will to persevere, the will to squeeze maximum performance out of the available hardware. The will to succeed. The deciding phase has begun. The teams are lining up for tomorrow’s last day. Here, there’s not been a preliminary decision regarding any medals. Even SUSA (#1) could go empty handed. SG (#2) are putting the pressure on which they’ve got to do because TC (#3) are pushing even harder. The joker could be CNT (#4). Though the Czechs are losing ground, a massive bunker on the closing day would not be unrealistic. It remains to be seen if it will be substantial enough. P3D at #5 are finding it hard to keep up the tempo and are now coming under pressure from [H] (#6) who are showing us their best side at this Pentathlon. As is customary, TAAT have crunched to #7 and are increasing their distance to AF (#8) by the hour. OCN have already collected twice as many points as RKN at #10 which should make it difficult to dislodge them from #9. LTT Forums continue to secure #11 whilst behind them #12 continues to be hard fought over. BOINC@MIXI are still holding on to it but MK (#13) have finally stepped on the gas and thus shaken off 2ch (#14), BOINC@AUSTRALIA (#15), BOINC.Italy (#16) and Crunching@EVGA (#17). BOINC@Poland (#18) had to forfeit a place as well as USA (#19). AMD Users aren’t making any effort to get further ahead and so remain at #20 in the table. LITOMYSL (#21) have used the rough terrain to their advantage and managed to get past UK BOINC Team (#22). Almost marching in step are BOINC Confederation (#23) and BOINCstats (#24). Will they have to be apprehensive about Crystal Dream? The Dreamers have won a massive amount of places and thus caught Ukraine (#26) and SETIKAH (#27) red-handed. But so far the distances are minimal and each stumble could make quite a difference. BOINC@Pfalz (#28) and U.S. Army (#29) continue to run neck and neck and must prepare for a new fellow player as Das Kartell (#30) are on the move. SUSA are slowly but surely expanding their lead. P3D (#2) are trying to limit the damage and can at least keep SG (#3) at a distance. [H] have made a giant leap to #4 and have surprised their rivals which the [H]ardens mainly suspected at the Marathon. It’s quite a controversial strategy which could in the end result in two forth places. As a consequence, CNT have fallen back to #5. The deficit is already quite large. The same goes for TC (#6) who are moving along just behind the Czechs. It remains to be seen if both their end spurts can wipe out their arrears. TAAT have slipped down to #7 but at least still ahead of AF (#8). The Francophones should remain vigilant. LITOMYSL (#9) and OCN (#10) are currently engaged in a hot battle which could push both teams further forward. BOINC.Italy (#11) and USA (#12) aren’t paying any attention to all these position changes. However, that will soon change. RKN (#13) and MK (#14) have woken up and are moving towards the front. SETIKAH (#15) and Chinese Dream (#16) were the last victims of Meisterkühler and together with Crunching@EVGA (#17), BOINC@AUSTRALIA (#18) and Ukraine (#19) might want to launch a self-help group. AMD Users at #20 have no need of that. 2ch have just taken up #21 followed by the teams on equal credits of Das Kartell and BOINC@Poland at #22. BOINCstats (#24) were able to benefit from a weak phase of Crystal Dream (#25) but the dream bubble isn’t about to burst just yet. The medals had practically been handed out already: SUSA ahead of P3D ahead of [H]. But Bronze at least is threatening to wobble. This is due to TC who continue to catch up and will be in striking distance right until the end. [H] are currently causing a stir at the City Run and could potentially risk their Bronze medal at the Marathon. There aren’t any changes for quite a stretch behind them. It’s only at #16 where there’s been some development. That’s where Chinese Dream pounced and with a hefty interim spurt relegated BOINC.Italy to #17. Even the fight for #19 is beginning to get interesting. 2ch (#19) had to look on as BOINC@MIXI (#20) overtook UK BOINC Team (#21) and have now set their course. At the end of the field, SETIKAH won #28 and so pushed back USA (#29). Gone are the times when there were big leaps in the Overall Standings. The teams are preparing for the end battles which will bring about a bit more movement. SUSA remain in the lead ahead of P3D (#2) and SG (#3). TC (#4), [H] (#5) and CNT (#6) continue to lie in wait and keep their focus on Bronze. And just behind, TAAT have currently managed to stand at #7 in all assessments, quite a feat. However, AF (#8) and OCN (#9) could still spoil their plan. The Top10 continues to be concluded by RKN. MK (#11) should keep an eye on BOINC.Italy (#12) and also USA (#13) and BOINC@AUSTRALIA (#14) who remain visible on the radar. Crunching@EVGA are currently beginning to fortify #15 which is made easier as Chinese Dream (#16) had to forfeit some points at the City Run. This is bringing LTT Forums (#17) and AMD Users (#18) closer to the Chinese and gives both new hope. Even though 2ch (#19) and BOINC@Poland (#20) are packed tight, there’s currently not a lot of friction between the two. LITOMYSL (#21) might be able to coax a fire to burn. Behind, MIXI (#23) had to let Ukraine (#22) pass just now, though on equal points. SETIKAH continue to defend at #24 ahead of UK BOINC Team (#25), BOINCstats (#26), Das Kartell (#27), Crystal Dream (#28) and BOINC Confederation (#29). The decision of who will cross the finish line at #30 in the end will be decided by U.S. Army and BOINC@Pfalz, whereby the Americans are currently enjoying a slight advantage. - When will the teams release the bunkers at the Cross Country? - What is still possible at the City Run? - What’s to come in the Marathon? Le 12e jour du Pentathlon est en cours. Les ordinateurs couinent et fument. Certains émettent des bruits bizarres. Et il y a du matériel qui a déjà rendu l'âme. Ce n'est pas tout à fait le cas pour les cruncheurs correspondants, mais les derniers jours se lisent quand même sur leur figure. Certaines équipes semblent sonnées, d'autres ont l'air d'avoir tout juste démarré. À la fin, le point décisif ne sera pas seulement la forme, mais la volonté de tenir, la volonté de tirer le maximum de soi et de la technique présente. La volonté de vaincre. La phase décisive a commencé. Les équipes se mettent en place pour la dernière journée demain. Aucune décision préalable n'est encore tombée concernant les médailles. Même SUSA (#1) pourrait encore partir les mains vides. SG (#2) la met sous pression et elle est bien obligée, car TC (#3) fait de même avec elle. Le joker pourrait être CNT (#4). Certes, les Tchèques perdent du terrain, mais il n'est pas farfelu de penser à un lâcher massif le dernier jour. La seule question qui se pose est de savoir s'il sera assez puissant. P3D, au rang 5, peine à suivre le rythme et se trouve maintenant sous pression de [H] (#6) qui donnent vraiment tout sur ce Pentathlon. Comme à son accoutumée, TAAT s'est posée sur la 7e place et augmente d'heure en heure son avance sur l'AF (#8). OCN a déjà amassé deux fois plus de points que RKN au rang 10 et il devrait être difficile de la chasser du rang 9. LTT Forums continue à sécuriser la 11e place, tandis que la bataille continue à faire rage autour du rang 12. Pour l'instant, BOINC@MIXI tient encore la place, mais MK (#13) a enfin accéléré et vient de se débarrasser de 2ch (#14), BOINC@AUSTRALIA (#15), BOINC.Italy (#16) et Crunching@EVGA (#17). BOINC@Poland (#18) a dû céder une place, tout comme USA (#19). Les AMD Users n'entreprennent rien pour progresser et ils restent donc au rang 20 du classement. LITOMYSL (#21) a su se servir du terrain inhospitalier pour dépasser UK BOINC Team (#22). Actuellement, BOINC Confederation (#23) et BOINCstats (#24) avancent presque au pas. Ont-elles quelque chose à craindre de Crystal Dream? Les rêveurs ont gagné beaucoup de places et ont ainsi refroidi l'Ukraine (#26) et SETIKAH (#27). Mais pour l'instant, les écarts sont encore minimes et le moindre trébuchement peut tout changer. BOINC@Pfalz (#28) et U.S. Army (#29) continuent à avancer tête à tête, mais elles doivent s’accommoder d'un nouveau joueur car Das Kartell (#30) arrive. SUSA consolide lentement mais sûrement sa position de tête. P3D (#2) tente de limiter les dégâts et arrive au moins à garder SG (#3) à distance. [H] a fait un énorme bond jusqu'à la 4e place et surprend ainsi la concurrence qui la pensait essentiellement prise par le Marathon. Une stratégie assez délicate qui pourrait se terminer avec deux quatrièmes places. CNT vient donc de retomber au rang 5 pour l'instant. Le retard est passablement grand. C'est aussi valable pour TC (#6) qui se trouve à courte distance des Tchèques. Reste à voir si le sprint final des deux équipes peut encore rattraper ce retard. TAAT est retombée au rang 7, mais une fois de plus devant l'AF (#8). Les Francophones devraient faire attention. LITOMYSL (#9) et OCN (#10) se livrent actuellement une bataille acharnée qui pourrait les pousser encore plus en avant. En revanche, BOINC.Italy (#11) et USA (#12) prennent note de tous ses changements sans se laisser impressionner. Mais cela ne devrait pas tarder à changer. RKN (#13) et MK (#14) se sont réveillées et avancent d'un pas ferme. SETIKAH (#15) et Chinese Dream (#16) étaient les dernières victimes des Meisterkühler et elles peuvent fonder un groupe de parole avec Crunching@EVGA (#17), BOINC@AUSTRALIA (#18) et Ukraine (#19). Les AMD Users, au rang 20, n'en ont pas besoin. 2ch est actuellement enregistré à la place 21, devant les équipes ex æquo Das Kartell et BOINC@Poland au rang 22. BOINCstats (#24) a réussi à profiter d'un coup de mou de Crystal Dream (#25), mais le rêve n'est pas encore terminé. À vrai dire, les médailles semblaient attribuées: SUSA devant P3D devant [H]. Mais au moins le bronze menace de vaciller, car TC remonte continuellement et devrait se trouver à portée de tir d'ici la fin. À la Course Urbaine, [H] est en train de provoquer des remous et pourrait ainsi mettre en danger la médaille de bronze au Marathon. Derrière, il n'y a quasiment pas de changement. Ce n'est qu'au rang 16 qu'il s'est passé quelque chose: Chinese Dream a frappé et a renvoyé BOINC.Italy au rang 17 grâce à un puissant sprint intermédiaire. La bataille pour le rang 19 sera également intéressante: 2ch (#19) a dû regarder, impuissante, comment BOINC@MIXI (#20) a doublé UK BOINC Team (#21) et mis le cap sur elle maintenant. En fin de peloton, SETIKAH a conquis la 28e place et repoussé USA (#29). Les temps des grands bonds au classement général semblent terminés. Les équipes se parent pour les finales - ce qui devrait aussi amener plus de mouvement ici. SUSA continue à mener devant P3D (#2) et SG (#3). TC (#4), [H] (#5) et CNT (#6) sont encore aux aguets et ont toujours le bronze en ligne de mire. Derrière, TAAT a réellement réussi à se trouver au 7e rang dans tous les classements, c'est une performance à part. L'AF (#8) et OCN (#9) pourraient toutefois encore contrer leurs plans. Le top10 est complété par RKN. MK (#11) devrait faire attention à BOINC.Italy (#12); USA (#13) et BOINC@AUSTRALIA (#14) sont également toujours visibles sur leur radar. Pendant ce temps, Crunching@EVGA sécurise un peu la 15e place, entre autres parce que Chinese Dream (#16) a perdu des points à la Course Urbaine. Cela rapproche LTT Forums (#17) et les AMD Users (#18) des Chinois et donne un nouvel espoir à ces deux équipes. 2ch (#19) et BOINC@Poland (#20) sont certes très proches, mais il n'y a pas vraiment d'étincelles entre ces deux équipes. Peut-être que LITOMYSL (#21) peut ranimer un peu les braises? Derrière, BOINC@MIXI (#23) vient juste de laisser passer l'Ukraine (#22), mais elles sont ex æquo. SETIKAH défend sa 24e place devant UK BOINC Team (#25), BOINCstats (#26), Das Kartell (#27), Crystal Dream (#28) et BOINC Confederation (#29). Savoir qui passera finalement la ligne d'arrivée à la 30e place se décidera entre U.S. Army et BOINC@Pfalz, les Américains ayant actuellement une légère avance. - Quand les équipes feront-elles leurs lâchers au Cross-country? - Qu'est-il encore possible de faire à la Course Urbaine? - Comment les choses vont-elles continuer au Marathon? Der 12. Tag des Pentathlon läuft. Die Rechner ächzen und qualmen. Manch einer gibt komische Geräusche von sich. Und einige Hardware hat bereits das zeitliche gesegnet. Ganz so schlimm ist es mit unseren dazugehörigen Crunchern nicht, aber auch ihnen sind die vergangenen Tage anzusehen. Einige Teams wirken angeschlagen, andere als wären sie gerade gestartet. Am Ende wird nicht nur die Fitness ausschlaggebend sein, sondern der Wille zum durchhalten, der Wille alles aus sich und der vorhandenen Technik rauszuholen. Der Wille zum Erfolg. Die entscheidende Phase hat begonnen. Die Teams bringen sich für den morgigen Schlusstag in Stellung. Eine Vorentscheidung ist hier um keine Medaille gefallen. Selbst SUSA (#1) könnte noch leer ausgehen. SG (#2) macht Druck und muss dies auch, denn TC (#3) macht noch mehr Druck. Der Joker könnte CNT (#4) sein. Die Tschechen verlieren zwar an Boden, doch eine massiver Bunker am Schlusstag ist nicht unrealistisch. Offen ist nur, ob dieser stark genug sein wird. P3D auf #5 fällt es schwer das Tempo mitzugehen und gerät nun unter Druck von [H] (#6) die bei diesem Pentathlon wirklich alles aus sich herausholen. TAAT hat sich standesgemäß auf #7 gecruncht und vergrößert stündlich seinen Vorsprung auf AF (#8). OCN hat bereits doppelt so viele Punkte gesammelt wie RKN auf #10 und dürfte so nur schwer von #9 zu verjagen sein. LTT Forums sichert weiter #11 ab, während dahinter #12 weiter hart umkämpft ist. Noch hat BOINC@MIXI diesen Platz inne, aber MK (#13) hat nun endlich Gas gegeben und dabei bereits 2ch (#14), BOINC@AUSTRALIA (#15), BOINC.Italy (#16) und Crunching@EVGA (#17) abgeschüttelt. BOINC@Poland (#18) hat einen Platz abgeben müssen, ebenso wie USA (#19). Die AMD Users machen keine Aktivitäten, um nach vorne zu kommen und so bleibt weiter #20 in der Wertung stehen. LITOMYSL (#21) hat das raue Gelände nutzen können und ist am UK BOINC Team (#22) vorbeigegangen. Fast im Gleichschritt sind derzeit die BOINC Confederation (#23) und BOINCstats (#24) unterwegs. Ob Sie etwas vom Crystal Dream zu befürchten haben? Die Träumer haben massiv Plätze gewonnen und haben so Ukraine (#26) und SETIKAH (#27) eiskalt erwischt. Doch noch sind die Abstände minimal und jeder Stolperer kann alles ändern. BOINC@Pfalz (#28) und U.S. Army (#29) sind weiter Kopf an Kopf unterwegs und müssen sich auf einen neuen Mitspieler einstellen, denn Das Kartell (#30) ist im Anmarsch. SUSA baut langsam aber stetig seine Führung aus. P3D (#2) versucht den Schaden in Grenzen zu halten und kann zumindest SG (#3) auf Distanz halten. Einen gewaltigen Satz auf #4 hat [H] gemacht und überrascht damit die Konkurrenz, die die Harden hauptsächlich beim Marathon wähnten. Eine durchaus heikle Strategie, die am Ende mit zwei vierten Plätze enden könnte. CNT ist dadurch erstmal auf #5 zurückgefallen. Der Rückstand ist schon recht groß. Das gilt auch für TC (#6), die kurz hinter den Tschechen unterwegs sind. Es bleibt abzuwarten, ob der Endspurt der beiden den Rückstand noch wettmachen kann. TAAT ist auf #7 gefallen, aber immerhin wieder vor AF (#8). Die Francophonen sollten wachsam sein. LITOMYSL (#9) und OCN (#10) liefern sich derzeit einen heißen Kampf, der beide noch weiter nach vorne pushen könnte. Die ganzen Positionsänderungen nehmen dagegen BOINC.Italy (#11) und USA (#12) unbeeindruckt zur Kenntnis. Doch das wird sich bald ändern. RKN (#13) und MK (#14) sind aufgewacht und marschieren nach vorn. SETIKAH (#15) und Chinese Dream (#16) waren die letzten Opfer der Meisterkühler und können gemeinsam mit Crunching@EVGA (#17), BOINC@AUSTRALIA (#18) und Ukraine (#19) eine Selbsthilfegruppe gründen. Das haben die AMD Users auf #20 nicht nötig. 2ch ist gerade auf #21 geführt vor den creditgleichen Teams von Das Kartell und BOINC@Poland auf #22. BOINCstats (#24) konnte eine Schwächphase von Crystal Dream (#25) nutzen, allerdings ist der Traum hier noch nicht geplatz. Eigentlich schienen die Medaillen vergeben: SUSA vor P3D vor [H]. Doch zumindest Bronze droht zu wackeln. Denn TC holt stetig auf und wird bis zum Ende in Schlagdistanz sein. Beim Stadtlauf sorgt [H] gerade für Wirbel und könnte damit die Bronzemedaille beim Marathon aufs Spiel setzen. Dahinter gibt es eine Weile keine Veränderungen. Erst auf #16 hat sich etwas getan. Dort hat Chinese Dream zugeschlagen und mit einem kräftigen Zwischenspurt BOINC.Italy auf #17 verwiesen. Auch der Kampf um #19 wird noch interessant. 2ch (#19) musste mit ansehen, wie BOINC@MIXI (#20) das UK BOINC Team (#21 überholt hat und jetzt Kurs nimmt. Am Ende des Feldes hat noch SETIKAH #28 erobert und USA (#29) verdrängt. Die Zeiten großer Sprünge in der Gesamtwertung scheinen vorbei. Die Teams rüsten sich für die Endkämpfe, dann wird auch hier mehr Bewegung reinkommen. SUSA führt weiter vor P3D (#2) und SG (#3). TC (#4), [H] (#5) und CNT (#6) liegen noch auf der Lauer und haben Bronze ebenso noch anvisiert. Dahinter hat es TAAT aktuell wirklich geschafft in allen Wertungen auf #7 zu stehen, auch eine Leistung. AF (#8) und OCN (#9) könnten dies aber noch durchkreuzen. Die Top 10 vervollständigt weiterhin RKN. MK (#11) sollte auf BOINC.Italy (#12) aufpassen und auch USA (#13) und BOINC@AUSTRALIA (#14) sind weiter auf dem Radar sichtbar. Crunching@EVGA sichert derweil #15 etwas ab, auch weil Chinese Dream (#16) Punkte beim Stadtlauf eingebüßt hat. Dies bringt LTT Forums (#17) und AMD Users (#18) näher an die Chinesen heran und gibt den beiden neue Hoffnung. 2ch (#19) und BOINC@Poland (#20) sind zwar eng zusammen, aber so richtig prickeln tut es zwischen den beiden derzeit nicht. Vielleicht kann ja LITOMYSL (#21) etwas Feuer in die Sache bringen. Dahinter hat MIXI (#23) gerade die Ukraine (#22) passieren lassen müssen, allerdings mit Punktegleichstand. SETIKAH verteidigt auf #24 vor UK BOINC Team (#25), BOINCstats (#26), Das Kartell (#27), Crystal Dream (#28) und der BOINC Confederation (#29). Wer am Ende auf #30 durchs Ziel gehen wird, entscheidet sich zwischen U.S. Army und BOINC@Pfalz, wobei die Amerikaner aktuell einen leichten Vorsprung haben. - Wann lassen die Teams die Bunker beim Querfeldein los? - Was ist noch möglich beim Stadtlauf? - Wie geht es weiter im Marathon? More than 2/3 of the Pentathlon is now behind us and we thus enter the deciding phase in this year’s event. Three disciplines are still active and the effort is written all over the teams‘ faces. SUSA are the first team who could potentially win all five races in one year which would constitute a phenomenal achievement. However, there’s still time for the other teams to put a spoke in their wheel. It’s in the nature of this race that distances grow the more time passes. However, the battle at the City Run will tempt the teams into drawing off resources and only maintain the established distance here. And that can quickly go awry. There had to come a reaction from SUSA (#1) or they would otherwise have got their tail feathers singed in P3D‘s (#2) in pursuit of them. [H] (#3) too are forced to counter-steer to prevent TC (#4) from coming any closer. That has repercussions in their performance at the City Run and possibly affects both teams. On the other hand, SG (#5) are maintaining a high tempo and the Germans are even extending their advantage over OCN (#6). The question must be asked how meaningful that is as they are right in the middle of the battle for medals at Asteriods. TAAT (#7) can only hope that CNT (#8) move their focus over to the City Run as it might get pretty tight otherwise. On the other hand, AF seem to be content with #9 and don’t appear to feel any pressure from MK (#10), AMD Users (#11) and RKN (#12). The margins within this trio are tight enough to allow for improvement in ranks but also for losses. It’s beginning to get a little tight for USA at #13 as BOINC@AUSTRALIA (#14) are advancing fast in long strides. Crunching@EVGA (#15) might find themselves a little too far away. Caution is advised in regards to BOINC.Italy (#16) und Chinese Dream (#17). However, it looks as if the Chinese dream bubble has burst because you couldn’t possibly describe this as running. You think you are watching it in slow motion though they do rear up now and again. Ukraine continue to float between the worlds at #18 but the Ukraine team should not get too complacent. 2ch (#19) have got the better of UK BOINC Team (#20) who have come under pressure from BOINC@MIXI (#21) who in turn have overtaken Das Kartell (#22). BOINCstats at #23 can’t decide whether to keep in touch with those in front or behind. The current tendency seems to be to go forwards. LTT Forums (#24) and LITOMYSL (#25) have changed places and attempt to detach from Crystal Dream (#26), BOINC@Poland (#27), U.S. Army (#28), SETIKAH (#29), BOINC@Pfalz (#30) and BOINC Confederation. SUSA continue to lead the pursuit for points but SG (#2) are not giving in and setting everything in motion to keep up. TC (#3) on the other hand had to break off. Tactics or weakness? We will see. We must always consider tactics when looking at CNT (#4) even though the deficit is already becoming quite large. This year too, P3D (#5) appear to be weak in the GPU-discipline which sees them forfeit vital points in the Overall Standings. AF are coming under pressure at #6 from [H] (#7) who have picked up their pace considerably. They have changed places with OCN (#9). TAAT continue to remain at #8. A really strong performance by LTT Forums who have clawed #10 off RKN (#11). The Rechenkraftlers can afford a calm look to the rear as the next battling teams are a few light years away. That group of battling rivals really pack a punch. They are led by BOINC@MIXI (#12) who are in a skin-tight duel with 2ch (#13) at the moment. Close behind follow BOINC@AUSTRALIA (#14) and BOINC.Italy (#15) who are also packed tight together. Lying in wait and using the slipstream are MK (#16) and BOINC@Poland (#17). The spectators are witness to a fight between three teams behind. USA still at #18 are awaiting the overtaking manoevre of Crunching@EVGA (#19) who have made a mega leap and thus surprised their neighbour in the standings, AMD Users (#20). Other casualties were UK BOINC Team (#21), LITOMYSL (#22) and BOINC Confederation (#23). Unimpressed, BOINCstats are holding on to #24. The Statiticians are quite able to do that as there’s no danger from behind. SETIKAH (#25) and Ukraine (#26) were able to improve which had as a consequence that U.S. Army (#27) and BOINC@Pfalz (#28) deteriorated. Behind them, Crystal Dream (#29) are trying to stir these two up which already gave them success with Das Kartell (#30). SUSA are having to put up a fight to keep their competitors at bay. Neither P3D (#2) nor SG (#3) are willing to give up. However, we shouldn’t discount CNT (#4) and TC (#5) in the fight for medals as final bunker actions can and will stir up the field. OCN have lost quite a bit of ground, now only at #9. TAAT (#6), AF (#7) and [H] (#8) were thus able to benefit. The strong interim sprint of [H] has cost LITOMYSL (#10), BOINC.Italy (#11), USA (#12) and Chinese Dream (#13) a place. In all that commotion, SETIKAH (#14) are creeping up to the Chinese and are nearly in a position to overtake. It’s unusual for RKN at #15 to be so far behind but that doesn’t have to be their permanent resting place. Crunching@EVGA (#16) are coming closer as well as BOINC@AUSTRALIA (#17) who aren’t that far away. Ukraine can be found at #18 ahead of the solidly frozen MK (#19), AMD Users (#20) and Das Kartell (#21). 2ch (#22) have managed to gain 2 places and have just activated their blinkers. Not attracting much attention are BOINC@Poland (#23), Crystal Dream (#24), BOINCstats (#25) and BOINC@MIXI (#26). At this moment, LTT Forums appear to be out of breath and if not careful, #27 could soon be gone as UK BOINC Team (#28) are already on their heels. Then follow BOINC Confederation (#29), U.S. Army (#30), BOINC@Pfalz (#31) and SETI.Bitola (#32). SUSA are clearly in the lead and it ought not be possible to separate them from their Gold. In addition, P3D seem secure at #2 but watch out as a lot can still happen at the City Run and Cross Country. SG continue to hold on to #3 only just ahead of TC (#4) and CNT (#5) who have still got potential. Now [H] (#6) decide to get into the fray. A powerful increase in speed at the City Run and Cross Country are pushing them back into the fight for overall medals. TAAT are once again the 7th little goat which is being pursued by the Francophone rooster (#8) in sheep’s clothing. OCN at #9 have had to concede some ground but should be able to retaliate. There don’t seem to be many chances for RKN (#10) to improve, their arrears are already quite substantial. Rechenkraftlers won’t be easy to banish from the Top 10 as BOINC.Italy (#11), USA (#12) and BOINC@AUSTRALIA (#13) would have to surpass themselves. Only #14 for MK leaves us wondering why, especially as at Asteroids it’s not looking great. Or is that a sign? Crunching@EVGA have crunched to #15, past Chinese Dream (#16). Super progress in the Cross Cuntry but desolate in the City Run, that‘s LTT Forums (#17). This is resulting in an increase in distance to the front and allows the following teams of AMD Users (#18), 2ch (#19) and BOINC@Poland (#20) to be hopeful. We can find LITOMYSL at #21, followed by Ukraine (#22), BOINC@MIXI (#23), SETIKAH (#24) and UK BOINC Team (#25). BOINCstats have dug in at #26 and behind in the points are Das Kartell (#27), Crystal Dream (#28), BOINC Confederation (#29), U.S. Army (#30) and BOINC@Pfalz (#31). - Can we expect a bunker from MK at the City Run? - Can [H] reach for Bronze in the Overall Standings? - Will TAAT succeed to cross the finish line at #7 in all the races? Plus des 2/3 du Pentathlon sont derrière nous et nous entrons désormais dans la phase décisive du challenge de cette année. Trois disciplines sont encore en cours et la tension se lit sur les visages des équipes. SUSA est la première équipe de tout temps pouvant gagner les cinq compétitions la même année, ce qui serait une performance extraordinaire. Mais les autres équipes ont encore du temps pour empêcher cela. Il est dans la nature des choses que les écarts grandissent au fur et à mesure du temps qui passe sur la piste longue. Et la bataille sur la Course Urbaine peut inciter les équipes à retirer des ressources ici pour vivre sur une avance acquise, mais cela peut rapidement échouer. Ainsi, SUSA (#1) a dû réagir maintenant, sinon la course de rattrapage de P3D (#2) aurait rapidement brûlé les plumes de queue du pygargue américain. [H] (#3) est également obligée de contrebraquer pour que TC (#4) ne se rapproche pas davantage. Par contre, cela se fait au détriment de leur performance à la Course Urbaine, probablement pour les deux équipes. De son côté, SG (#5) avance à un rythme soutenu; les Allemands arrivent même à étoffer leur avance sur OCN (#6). On se pose naturellement la question de savoir si c'est utile, car sur Asteroids elle est en pleine mêlée pour les médailles. TAAT (#7) espérera sûrement que CNT (#8) se focalise sur la Course Urbaine, sinon les choses pourraient encore devenir serrées. En revanche, l'AF semble être satisfaite du rang 9 et ne semble avoir rien à craindre de MK (#10), AMD Users (#11) et RKN (#12) non plus. Cependant, les écarts entre ce trio sont suffisamment faibles pour pouvoir encore gagner ou perdre des places. Pour USA les choses commencent à se resserrer au rang 13, car BOINC@AUSTRALIA (#14) approche à pas rapides. Crunching@EVGA (#15), pour sa part, devrait être un peu trop loin. Il s'agit de faire attention à BOINC.Italy (#16) et Chinese Dream (#17). Il semblerait, par contre, que le rêve chinois ait explosé en vol, car on ne peut plus appeler cela marcher. Un ralenti serait un terme plus approprié, même s'il y a parfois un soubresaut soudain. Au rang 18, l'Ukraine continue à flotter entre deux mondes, mais les Ukrainiens ne devraient pas être trop sûrs d'eux. 2ch (#19) vient de se faire UK BOINC Team (#20), qui se trouve maintenant sous la pression de BOINC@MIXI (#21), qui a à son tour dépassé Das Kartell (#22). BOINCstats au rang 23 n'arrive pas à se décider si elle veut plutôt se rapprocher des équipes devant elle ou derrière elle. Actuellement, on dirait qu'il y a une légère tendance vers l'avant. LTT Forums (#24) et LITOMYSL (#25) ont échangé leurs places et tentent toujours de se détacher de Crystal Dream (#26), BOINC@Poland (#27), U.S. Army (#28), SETIKAH (#29), BOINC@Pfalz (#30) et BOINC Confederation. SUSA continue à mener cette chasse aux nombres, mais SG (#2) n'abandonne pas et actionne tous les leviers pour rester au contact. TC (#3), en revanche, laisse filer. Est-ce de la tactique ou de la faiblesse? Nous verrons bien. Chez CNT (#4) nous devons toujours supposer de la tactique, même si le retard devient déjà assez conséquent. Cette année encore, la discipline GPU semble être le point faible de P3D (#5), ce qui leur fait perdre d'importants points pour la victoire globale. Au rang 6, l'AF est sous la pression de [H] (#7), qui a bien accéléré maintenant. Elle a changé de place avec OCN (#9). TAAT reste toujours au rang 8. Vraiment fortiche l'équipe LTT Forums, elle a arraché la 10e place à RKN (#11). Mais les gars et les filles de Rechenkraft peuvent se retourner avec moins de crainte, car le groupe de combat qui arrive derrière se trouve à plusieurs années-lumière. Pourtant, ce groupe de combat n'est pas piqué des hannetons. BOINC@MIXI (#12) le mène et se livre actuellement un corps-à-corps avec 2ch (#13). Juste derrière, nous trouvons BOINC@AUSTRALIA (#14) et BOINC.Italy (#15), où les choses sont très serrées aussi. Aux aguets et sous leur vent se trouvent MK (#16) et BOINC@Poland (#17). Derrière, les spectateurs peuvent assister à une triangulaire: USA, encore au rang 18, attend la manœuvre de dépassement de Crunching@EVGA (#19), qui a fait un méga-bond et a ainsi surpris sa voisine de tableau AMD Users (#20). D'autres victimes étaient UK BOINC Team (#21), LITOMYSL (#22) et BOINC Confederation (#23). Pas impressionnée le moins du monde, BOINCstats s'accroche au rang 24 et elle peut le faire, car aucun danger ne vient de l'arrière. SETIKAH (#25) et l'Ukraine (#26) ont réussi à s'améliorer un peu, ce qui a eu pour conséquence qu'U.S. Army (#27) et BOINC@Pfalz (#28) ont dégringolé. Derrière, Crystal Dream (#29) tente encore de les remuer; elle y est déjà arrivé avec Das Kartell (#30). SUSA doit vraiment se battre pour garder la concurrence à distance. Ni P3D (#2), ni SG (#3) sont disposées à abandonner. Mais n'oublions pas CNT (#4) et TC (#5) dans la bagarre pour les médailles, car des lâchers finaux peuvent provoquer et provoqueront beaucoup de mouvements. OCN perd beaucoup de terrain et n'est plus que 9e. TAAT (#6), AF (#7) et [H] (#8) ont réussi à profiter de la situation. Le puissant sprint intermédiaire de [H] a coûté une place à LITOMYSL (#10), BOINC.Italy (#11), USA (#12) et Chinese Dream (#13). Avec toute cette agitation, SETIKAH (#14) s'approche à pas de loup des Chinois et pourrait bientôt les dépasser. Étonnamment loin derrière nous trouvons RKN au rang 15, et ce n'est pas nécessairement le parking définitif. Crunching@EVGA (#16) s'approche et BOINC@AUSTRALIA (#17) n'est pas loin non plus. Nous trouvons l'Ukraine au rang 18, devant MK(#19), AMD Users (#20) et Das Kartell (#21), frigorifiés. 2ch (#22) a pu conquérir 2 places et a déjà mis le clignotant pour la prochaine manœuvre. Sans se faire remarquer, BOINC@Poland (#23), Crystal Dream (#24), BOINCstats (#25) et BOINC@MIXI (#26) ne s'occupent que d'eux-mêmes. LTT Forums semble manquer d'air actuellement et ainsi la 27e place pourrait bientôt appartenir à l'histoire, car UK Boinc Team (#28) est déjà sur ses talons. Suivent BOINC Confederation (#29), U.S. Army (#30), BOINC@Pfalz (#31) et SETI.Bitola (#32). SUSA mène clairement et ne devrait plus pouvoir être séparée de l'or. P3D aussi semble sûre au rang 2, mais attention, il peut encore se passer beaucoup de choses à la Course Urbaine et au Cross-country. SG se maintient toujours au rang 3, juste devant TC (#4) et CNT (#5), qui ont encore du potentiel. Et voilà que [H] (#6) s'apprête à entrer dans la ronde. Une puissante accélération à la Course Urbaine et au Cross-country les remettent en jeu pour les médailles au général. TAAT est à nouveau le 7e chevreau, suivi par le coq francophone (#8) en peau de loup. OCN au rang 9 a dû céder un peu de terrain, mais devrait être en mesure de réagir. Pour RKN (#10) les chances d'une amélioration sont assez faibles, le retard est quand même très grand. Mais les gars et les filles de Rechenkraft ne pourront pas être chassés si vite du top10, car BOINC.Italy (#11), USA (#12) et BOINC@AUSTRALIA (#13) devraient vraiment se surpasser. MK seulement à la 14e place laisse des questions en suspens. Surtout sur Asteroids, les choses n'ont pas l'air terribles. À moins que ce ne soit un signe? Crunching@EVGA s'est crunché à la 15e place, passant devant Chinese Dream (#16). Super-performance au Cross-country mais une désolation à la Course Urbaine - voilà ce qui s'applique à LTT Forums (#17). Il s'ensuit que le retard sur ses prédécesseurs augmente et que les poursuivants AMD Users (#18), 2ch (#19) et BOINC@Poland (#20) peuvent nourrir de nouveaux espoirs. Au rang 21 nous trouvons LITOMYSL, suivie par Ukraine (#22), BOINC@MIXI (#23), SETIKAH (#24) et UK BOINC Team (#25). BOINCstats est toujours figée au rang 26 et les dernières équipes avec des points sont Das Kartell (#27), Crystal Dream (#28), BOINC Confederation (#29), U.S. Army (#30) et BOINC@Pfalz (#31). - Y aura-t-il un lâcher de MK à la Course Urbaine? - [H] peut-elle espérer le bronze au classement général? - TAAT arrivera-t-elle à passer toutes les lignes d'arrivée à la 7e place? Mehr als 2/3 des Pentathlon liegen hinter uns und damit treten wir in die alles entscheidende Phase des diesjährigen Fünfkampfes ein. Noch drei Disziplinen laufen und den Teams steht die Anspannung ins Gesicht geschrieben. SUSA kann als erstes Team überhaupt alle fünf Wettbewerbe in einem Jahr gewinnen, was eine überragende Leistung wäre. Doch noch haben die anderen Teams Zeit, dies zu verhindern. Es liegt in der Natur der Sache, dass auf der langen Strecke die Abstände mit fortschreitender Zeit anwachsen. Doch der Kampf beim Stadtlauf wird Teams dazu verleiten Ressourcen abzuziehen und damit von einem erarbeiteten Vorsprung zu leben. Und dies kann schnell schief gehen. So musste SUSA (#1) jetzt reagieren, denn ansonsten hätte die Aufholjagd von P3D (#2) schnell für brennende Schwanzfedern bei den Amerikanern gesorgt. Auch [H] (#3) ist gezwungen gegenzusteuern, damit TC (#4) nicht noch näher kommt. Dies geht aber auf Kosten der Performance beim Stadtlauf und zwar möglicherweise bei beiden Teams. Dagegen hält SG (#5) das Tempo noch recht hoch, die Deutschen bauen sogar den Vorsprung auf OCN (#6) aus. Da stellt sich natürlich die Frage, ob das sinnvoll ist, denn bei Asteroids ist man ja mitten im Getümmel um die Medaillen. TAAT (#7) wird hoffen, dass CNT (#8) seinen Fokus auf den Stadtlauf legt, denn ansonsten könnte es nochmal eng werden. AF dagegen scheint mit #9 zufrieden und hat wohl auch von MK (#10), AMD Users (#11) und RKN (#12) nichts zu befürchten. Die Abstände zwischen diesem Trio sind aber eng genug, um noch Plätze gutzumachen oder auch zu verlieren. Für USA wird es auf #13 langsam eng, denn BOINC@AUSTRALIA (#14) ist mit flottem Tempo im Anmarsch. Etwas zu weit weg sollte aber Crunching@EVGA (#15) sein. Hier heißt es aufpassen auf BOINC.Italy (#16) und Chinese Dream (#17). Allerdings ist hier wohl der chinesische Traum geplatzt, denn laufen kann man das nicht mehr nennen. In Zeitlupe trifft es eher, auch wenn es manchmal ein plötzliches Aufbäumen gibt. Die Ukraine schwebt auf #18 weiter zwischen den Welten, aber zu sicher sollten die Ukrainer sich nicht sein. 2ch (#19) hat sich das UK BOINC Team (#20) geschnappt, welches unter Druck von BOINC@MIXI (#21) geraten ist, die wiederum Das Kartell (#22) überholt haben. BOINCstats auf #23 kann sich nicht entscheiden, ob sie den Anschluss nach vorn oder nach hinten herstellen wollen. Derzeit gibt es wohl eher eine leichte Tendenz nach vorn. LTT Forums (#24) und LITOMYSL (#25) haben die Plätze getauscht und versuchen sich weiter von Crystal Dream (#26), BOINC@Poland (#27), U.S. Army (#28), SETIKAH (#29), BOINC@Pfalz (#30) und der BOINC Confederation zu lösen. SUSA führt weiter die Zahlenjagd an, doch SG (#2) gibt nicht auf und setzt alle Hebel in Bewegung, um dranzubleiben. TC (#3) lässt dagegen abreißen. Ist das Taktik oder Schwäche? Wir werden es sehen. Bei CNT (#4) müssen wir immer Taktik vermuten, auch wenn der Rückstand schon recht groß wird. Auch dieses Jahr scheint die GPU-Disziplin die Schwachstelle von P3D (#5) zu sein, womit aber wichtige Punkte um den Gesamtsieg entschwinden. Auf #6 kommt AF unter Druck von [H] (#7), die jetzt kräftig Schwung aufgenommen haben. Sie haben mit OCN (#9) den Platz getauscht. TAAT bleibt weiter auf #8. Richtig stark unterwegs ist LTT Forums, die sich #10 von RKN (#11) gekrallt haben. Die Rechenkraftler können aber beruhigter nach hinten schauen, denn die Kampfgruppe dahinter ist schon einige Lichtjahre entfernt. Diese Kampfgruppe hat es aber in sich. BOINC@MIXI (#12) führt sie an und ist gerade im Haut-an-Haut-Duell mit 2ch (#13). Kurz dahinter folgt BOINC@AUSTRALIA (#14) und BOINC.Italy (#15), zwischen denen es auch arg eng ist. In Lauerposition und Windschatten bewegen sich dann noch MK (#16) und BOINC@Poland (#17). Ein Dreikampf können die Zuschauer dahinter erleben. USA, noch auch #18, erwartet das Überholmanöver von Crunching@EVGA (#19), die einen Mega-Sprung gemacht haben und so Tabellennachbar AMD Users (#20) überrascht haben. Weitere Opfer waren das UK BOINC Team (#21), LITOMYSL (#22) und BOINC Confederation (#23). BOINCstats hält dagegen unbeindruckt #24 fest. Das können die Statistiker auch, denn von hinten droht derzeit keine Gefahr. SETIKAH (#25) und die Ukraine (#26) konnten sich etwas verbessern, was zur Folge hatte, dass sich U.S. Army (#27) und BOINC@Pfalz (#28) verschlechterten. Dahinter versucht Crystal Dream (#29) die beiden noch aufzumischen, mit Das Kartell (#30) ist dies bereits geglückt. SUSA muss schon kämpfen, um die Konkurrenz auf Distanz zu halten. Weder P3D (#2) noch SG (#3) sind Willens aufzugeben. Aber auch CNT (#4) und TC (#5) sollten wir im Kampf um die Medaillen nicht abschreiben, denn finale Bunkeraktionen können und werden hier viel Bewegung verursachen. Kräftig an Boden verliert OCN, nur noch #9. Dies konnten TAAT (#6), AF (#7) und [H] (#8) für sich nutzen. Der starke Zwischensprint von [H] hat LITOMYSL (#10), BOINC.Italy (#11), USA (#12) und Chinese Dream (#13) einen Platz gekostet. SETIKAH (#14) schleicht sich bei der ganzen Aufregung langsam an die Chinesen heran und könnte bald vorbeigehen. Ungewohnt weit zurück ist RKN auf #15 und das muss nicht die endgültige Parkposition sein. Crunching@EVGA (#16) kommt näher und auch BOINC@AUSTRALIA ist nicht weit (#17) weg. Die Ukraine ist auf #18 zu finden, vor den erfrorenen MK (#19), AMD Users (#20) und Das Kartell (#21). 2ch (#22) hat 2 Plätze erobern können und hat bereits den nächsten Blinker gesetzt. Unauffällig miteinander beschäftigen sich BOINC@Poland (#23), Crystal Dream (#24), BOINCstats (#25) und BOINC@MIXI (#26). LTT Forums scheint derzeit die Luft zu fehlen und so könnte #27 bald weg sein, denn das UK BOINC Team (#28) ist bereits dran. Es folgen BOINC Confederation (#29), U.S. Army (#30), BOINC@Pfalz (#31) und SETI.Bitola (#32). SUSA führt klar und deutlich und dürfte nicht mehr von Gold trennbar sein. Auch P3D scheint auf #2 sicher, doch Obacht, beim Stadtlauf und Querfeldein kann noch viel passieren. SG hält weiter #3 fest nur knapp vor TC (#4) und CNT (#5), die noch Potential haben. Und nun schickt sich sich [H] (#6) an, mitzumischen. Eine kräftige Tempoverschärfung bei Stadtlauf und Querfeldein bringen sie wieder ins Spiel um die Gesamtmedaillen. TAAT ist wieder das 7. Geißlein, gefolgt vom francophonen Hahn (#8) im Wolfspelz. OCN auf #9 hat etwas Boden preisgeben müssen, sollte aber in der Lang sein, zu reagieren. Für RKN (#10) gibt es wohl kaum noch Chancen auf eine Verbesserung, der Rückstand ist schon sehr deutlich. Die Rechenkraftler werden nicht so einfach aus den Top 10 zu vertreiben sein, denn BOINC.Italy (#11), USA (#12) und BOINC@AUSTRALIA (#13) müssten schon über sich herauswachsen. Nur #14 für MK lässt Fragen offen, vor allem bei Asteroids sieht es nicht so toll ist. Oder ist das ein Zeichen? Crunching@EVGA hat sich auf #15 vorgecruncht, vorbei an Chinese Dream (#16). Super unterwegs beim Querfeldein, aber desolat beim Stadtlauf, das gilt für LTT Forums (#17). Dies hat zur Folge, dass der Rückstand nach vorne etwas anwächst und die Verfolger AMD Users (#18), 2ch (#19) und BOINC@Poland (#20) Hoffnung schöpfen können. Auf #21 ist LITOMYSL zu finden, gefolgt von Ukraine (#22), BOINC@MIXI (#23), SETIKAH (#24) und dem UK BOINC Team (#25). BOINCstats verharrt weiter auf #26 und dahinter stehen Das Kartell (#27), Crystal Dream (#28), BOINC Confederation (#29), U.S. Army (#30) und BOINC@Pfalz (#31) mit Punkten da. - Kommt ein Bunker von MK beim Stadtlauf? - Kann [H] nach Bronze in der Gesamtwertung greifen? - Schafft es TAAT, überall auf #7 durchs Ziel zu gehen?